Black panthers are the result of a genetic mutation in the Panthera that makes the animal all black. The gene is only carried by certain members of the Panthera family including the leopard and jaguar. 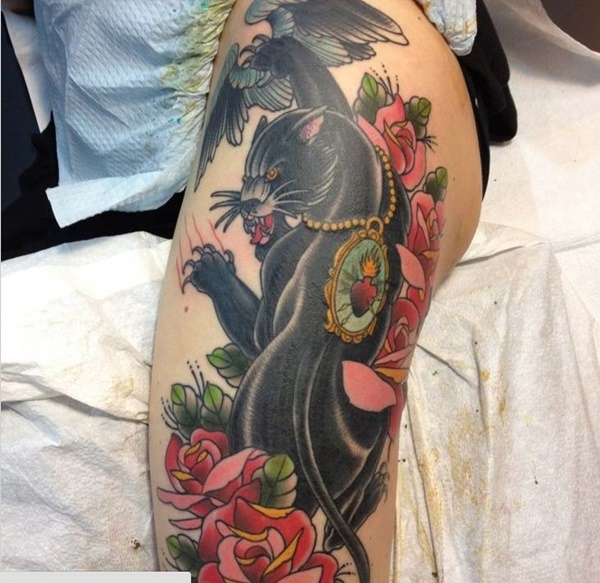 The majestic appearance of black panthers has made the animal a popular image in tattooing for decades. 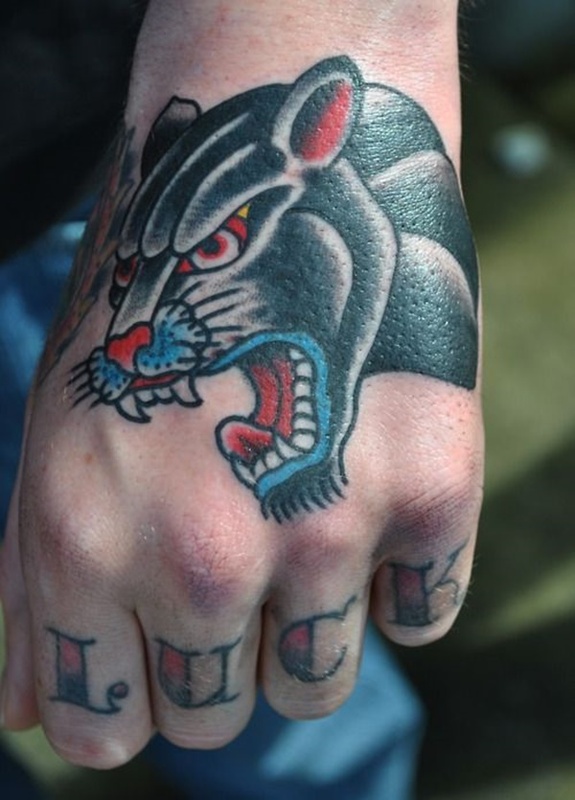 In this article we will be viewing some panther related tattoos and discovering what makes a panther tattoo great. 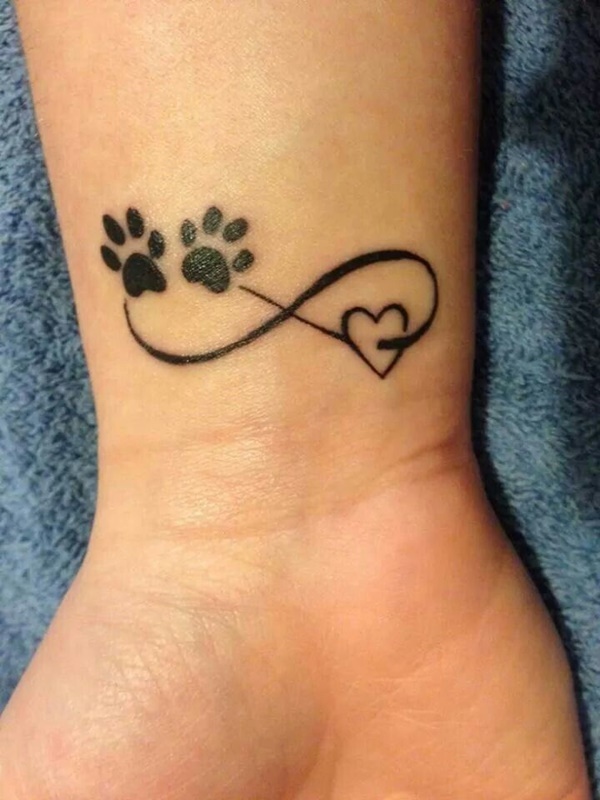 This tattoo shows an infinity sign with a heart on the right side and a pair of paw prints on the left side. The piece is worn on the wrist and most likely conveys the wearer’s eternal love of animals. 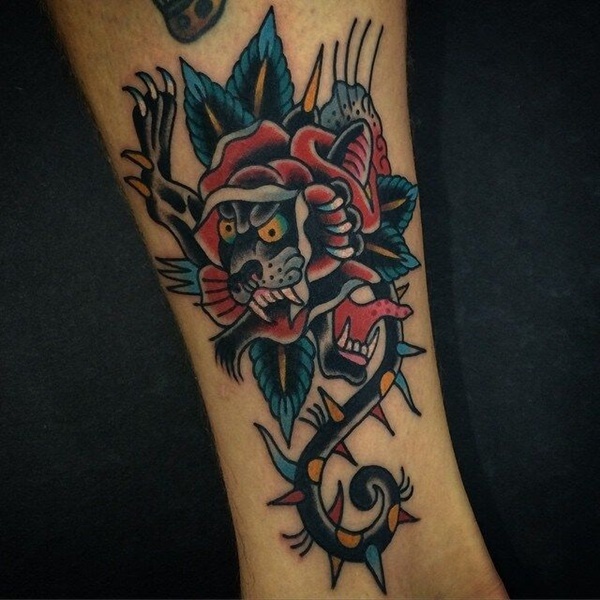 This neck tattoo portrays an incensed panther in a traditional style and color palette. This piece is a wonderful representation of traditional styling and modern placement. 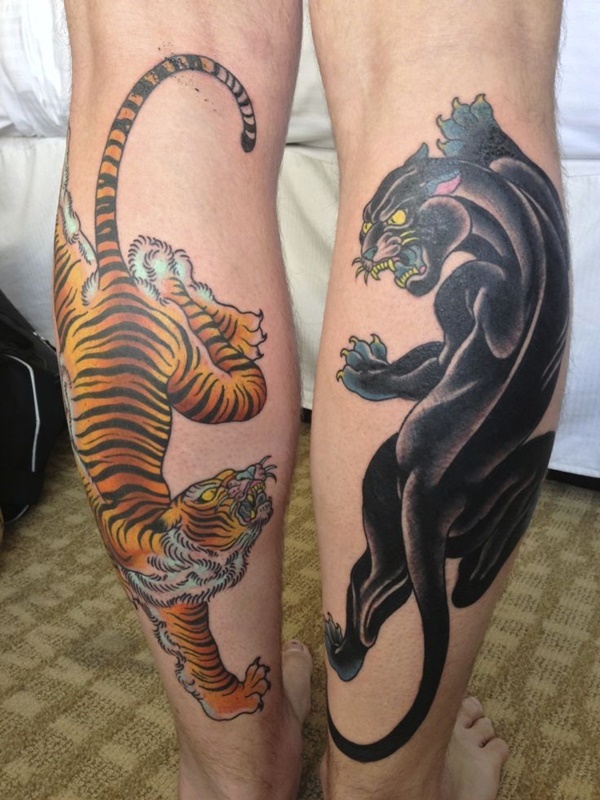 Two stunning renditions of jungle cats are seen in this incredible tattoo. 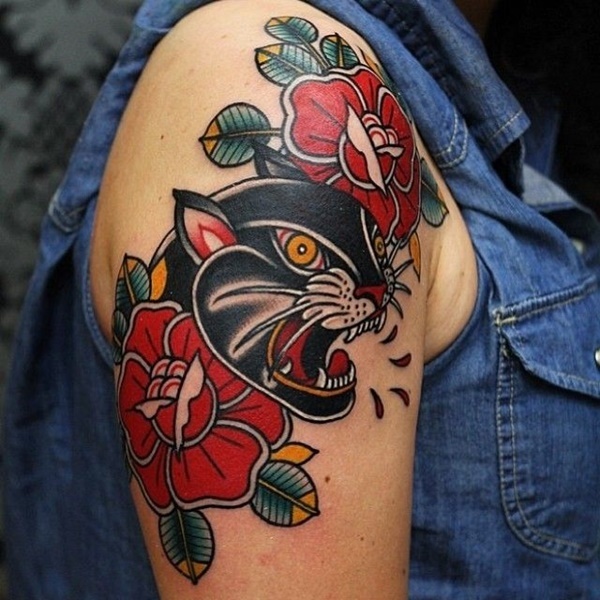 The positions of the cats create a sense of opposition and the traditional styling nods to the roots of western tattooing. 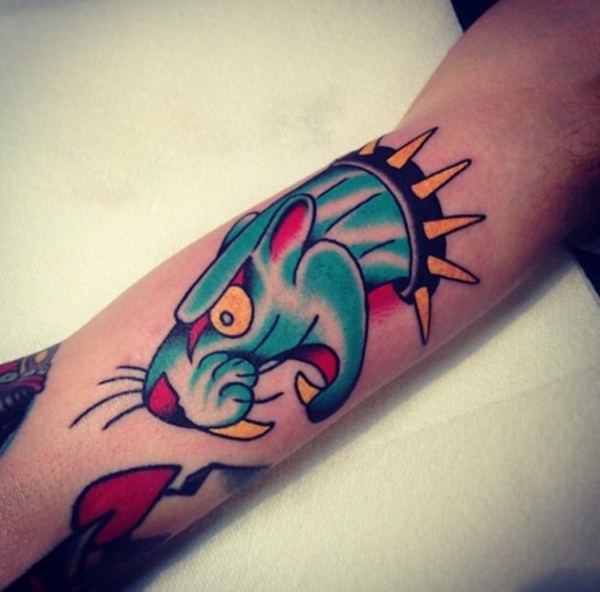 A classic rendition of a panther on the wearer’s bicep. Subtle details like the cat’s claws digging into the wearer’s flesh offer the piece a sense of complexity. 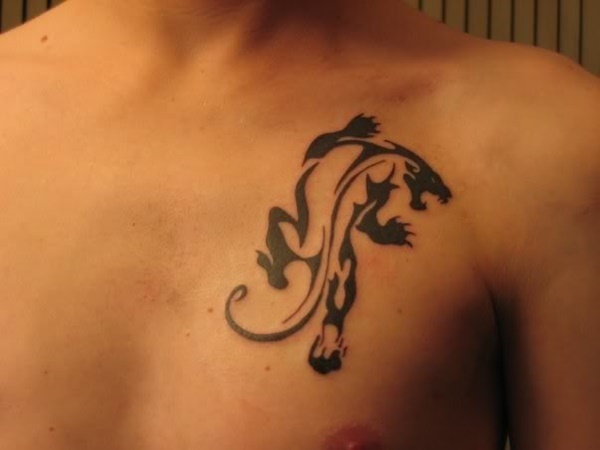 A simplified portrayal of a panther is shown on the wearer’s left shoulder blade. While the styling and color palette is traditional, this depiction of a panther is far from typical. 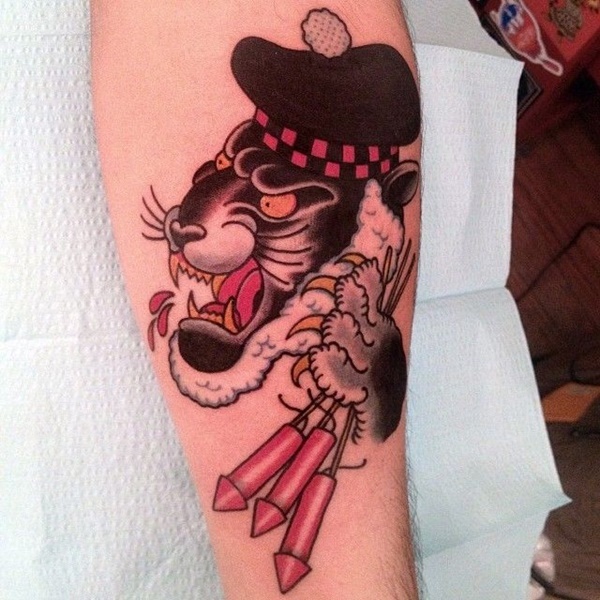 The image portrayed on the wearer’s forearm shows a panther with a white beard, a tam o’ shanter cap, and a pawful of bottle rockets. 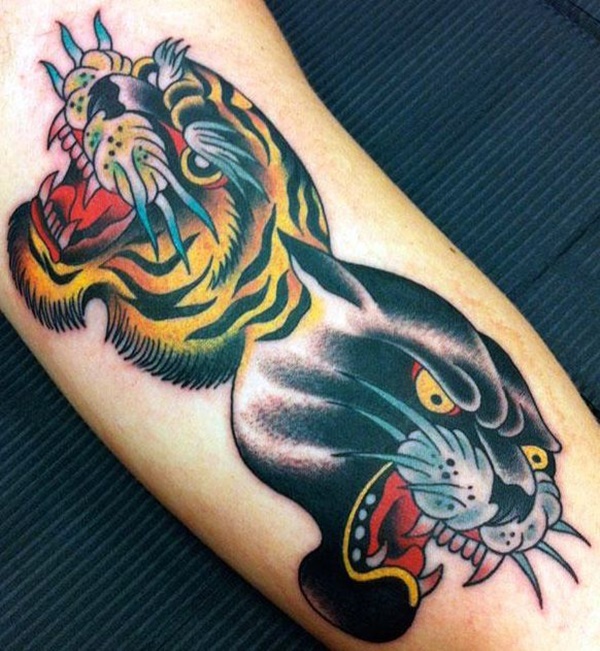 This tattoo depicts the heads of a panther and a tiger facing opposite directions. 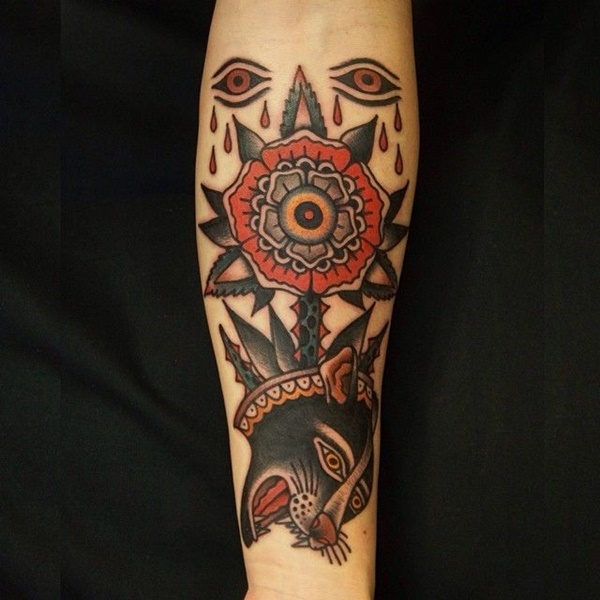 Using traditional styling and colors the artist made a cohesive piece on the wearer’s forearm. 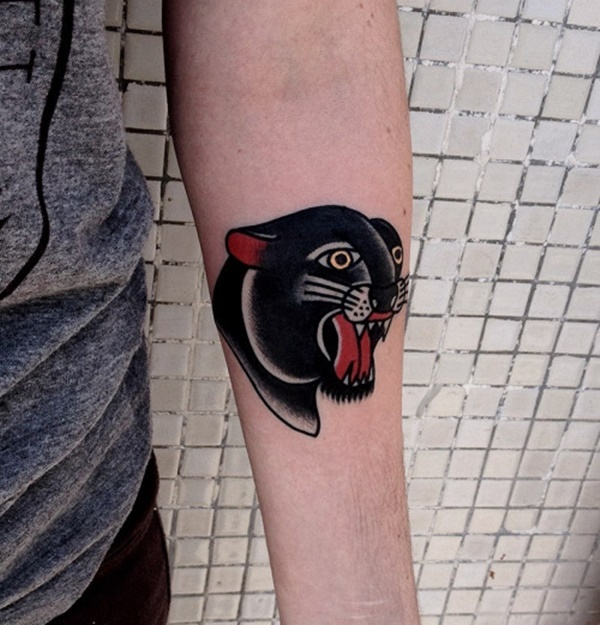 While this tattoo is obviously influenced by traditional styling the tattooist has emphasized the panther’s teeth and made the whiskers more realistic. 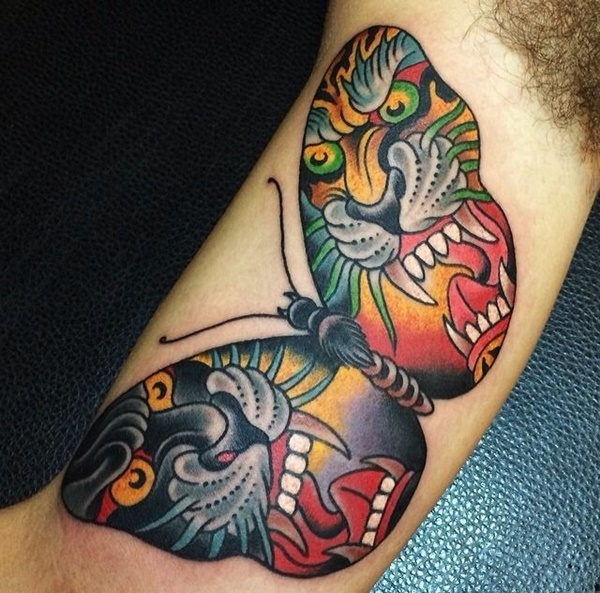 This unique take on the panther and tiger motif portrays the jungle cats on the wings of a moth. 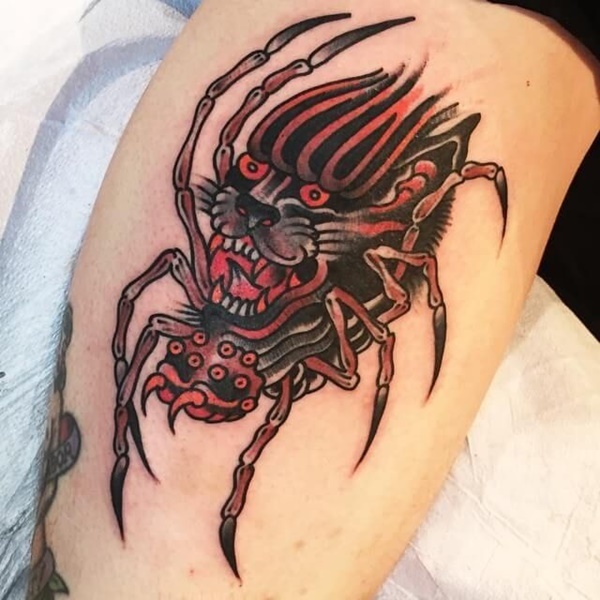 This freak show inspired piece is the combination of two, once glorious, creatures into the grotesquely impractical beast rendered before you.This black and red tattoo depicts a spider with a panther’s head attached to it’s abdomen. Although, I have no issue with the coloring, the concept is clunky and misguided. 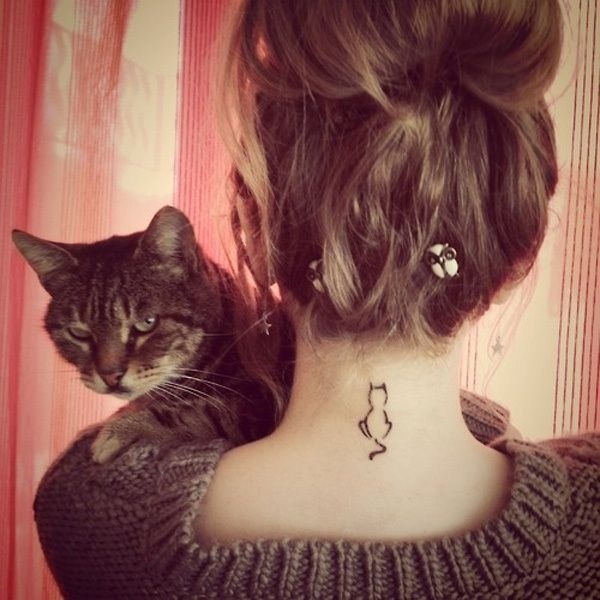 This adorable cat tattoo is a far cry from the other examples we’ve seen. A sketched silhouette of a cat’s back is depicted using black outlines. Native to North America, this big cat is known as a puma, cougar, or mountain lion depending on which region of the country the animal resides. This tattoo shows a beautiful sunset over a southwestern U.S. landscape using oranges and yellows. The background starkly contrasts with the dark cat in the foreground to create a magnificent piece. 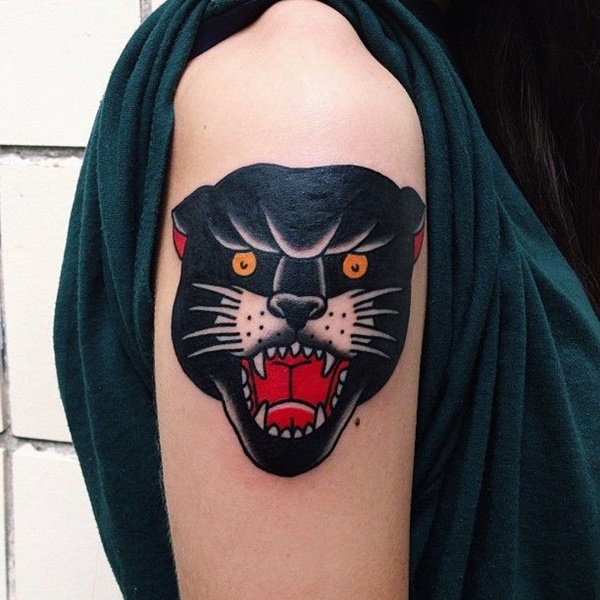 Depicted on the back of the wearer’s forearm, this panther has exaggerated brows and an odd facial expression that makes the animal look more confused than intimidating. Humanoid panthers with samurai training would surely mean the decimation of the human race. 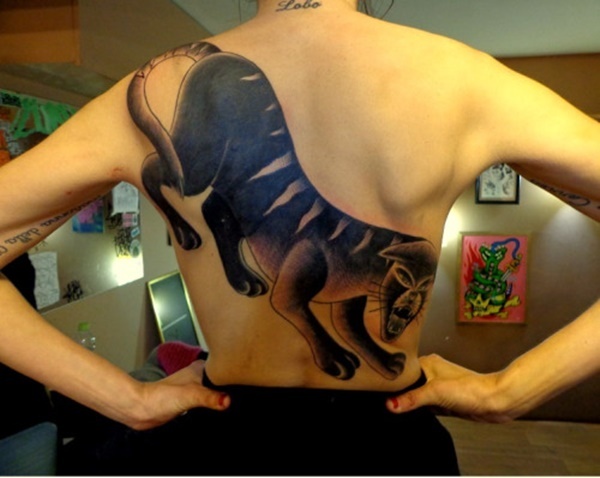 Luckily for us this apex predator only exists in this remarkably well done back piece. 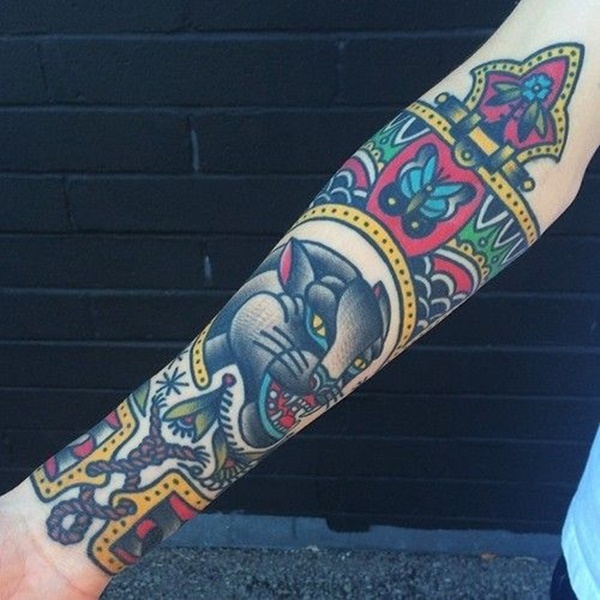 This tattoo uses traditional coloring to create a portrait of a panther surrounded by ornate patterns. The patterns are embellished with a rope and a butterfly to create a sense of complexity. I’m not sure what this animal with two different colored eyes is supposed to be, or why it can’t keep its tongue in its mouth. What I am sure of is the tensile strength of the beasts whiskers because they are holding the tongue aloft. “What do you want?” The tattoo artist asked. This is a beautiful rendition of a panther. 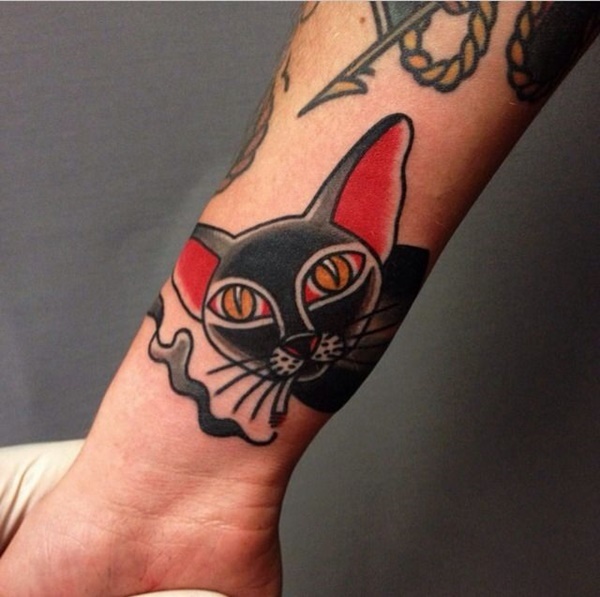 Subtle details like the position of the cats ear separate this tattoo from its counterparts. The ears are pointing backwards like the predator is about to pounce, while touches of blue in the eyes, gums, and whiskers bring the piece together. This is obviously a house cat smoking a joint. The kitties blood shot eyes indicate exactly what’s in the cigarette and create a unique aesthetic. 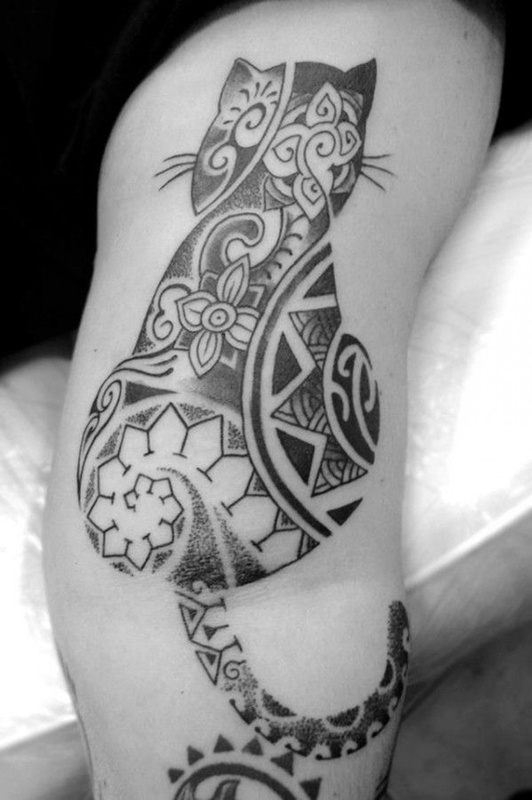 A silhouette of the back of a house cat is livened up with the use of a mandala pattern. A maniacal panther surrounded by fire is depicted on the back of the wearer’s head. This well done piece shows a superb use of color distribution, although, I can’t imagine the placement has made it easy for the wearer to find a romantic partner. I would assume it’s unnerving when your boyfriend rolls over in bed to reveal a hell-cat on the back of his head. 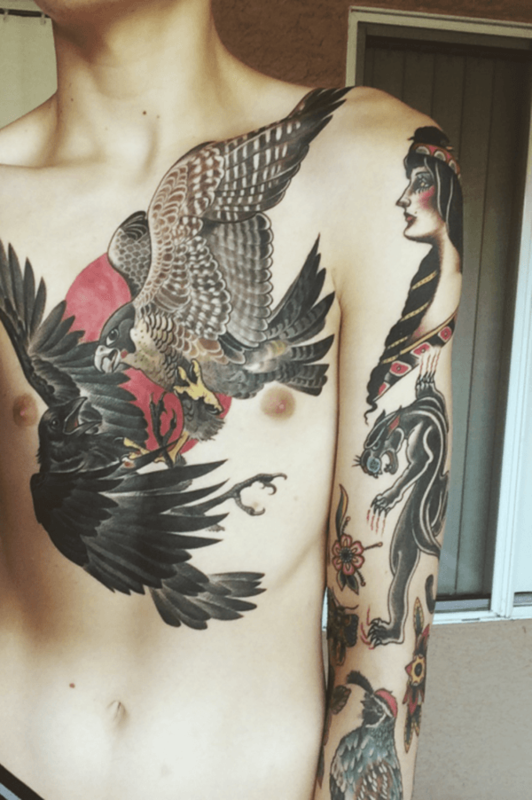 This incredible black and gray tattoo depicts a stoic panther with wings running the length of the wearer’s torso. 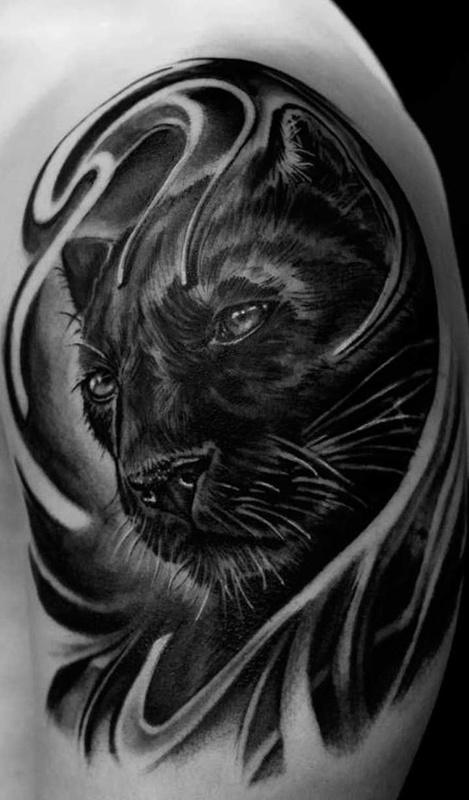 This life-life piece illustrates a black and gray portrait of a panther framed with swirling design. The incredible detail in this piece is a testament to the talent of the tattoo artist. 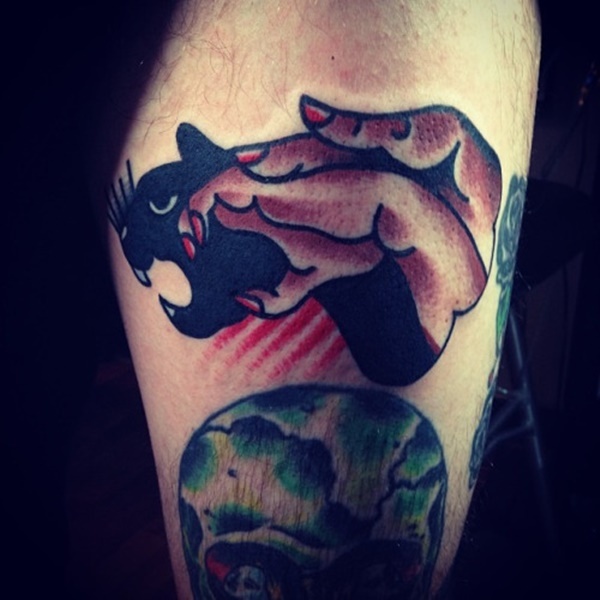 This simplified portrait of a panther portrays a panther using traditional coloring on the wearer’s hand. 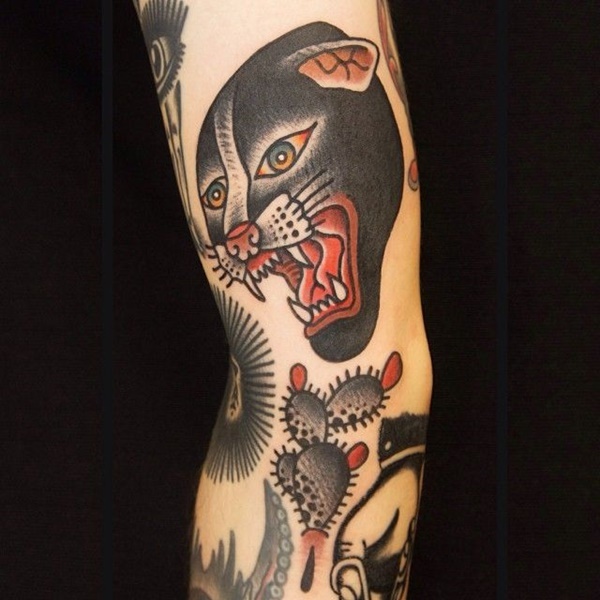 The jungle cat versus snake motif was a popular image among Navy sailors and has become prolific in modern tattoo culture. 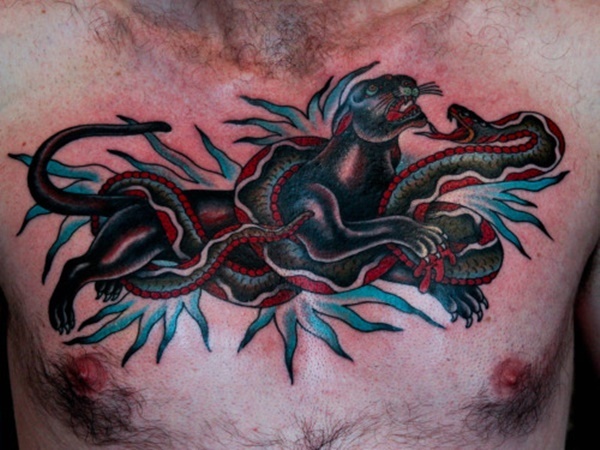 This tattoo shows a panther fighting snake, and for some reason both animals have concernedly bulging eyes indicative of a thyroid condition. A remarkably well done portrayal of the snake versus panther motif. 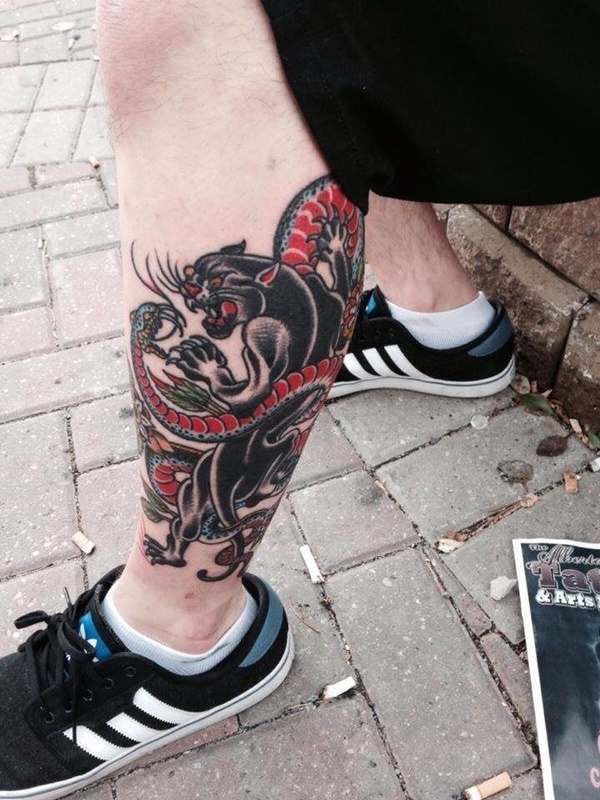 Impeccable use of coloring and the snake coiling around the panther’s head make this tattoo a stand-out. 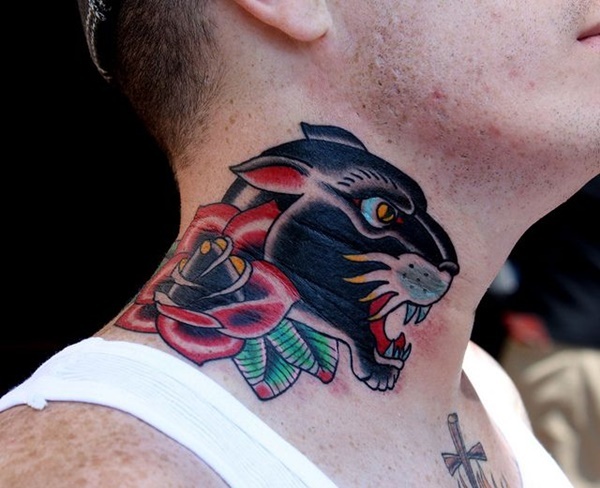 This tattoo, shown on the wearer’s neck, depicts a side profile of a traditionally colored and styled panther next to a rose with a black rosebud. 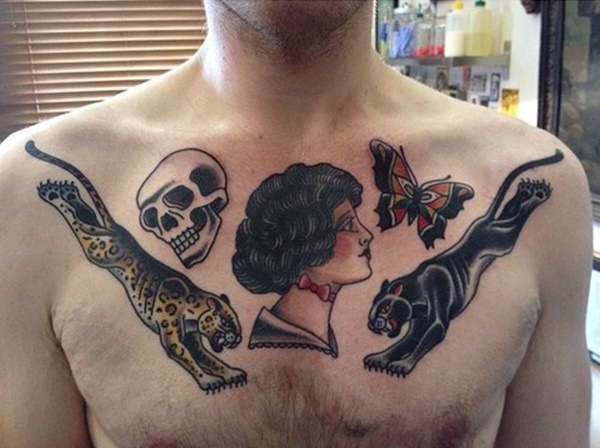 This amateur portrayal of a panther wearing a skull necklace lacks detail. No shading is used in the head of the panther and the disproportionately sized skulls are indicative of an inexperienced artist. 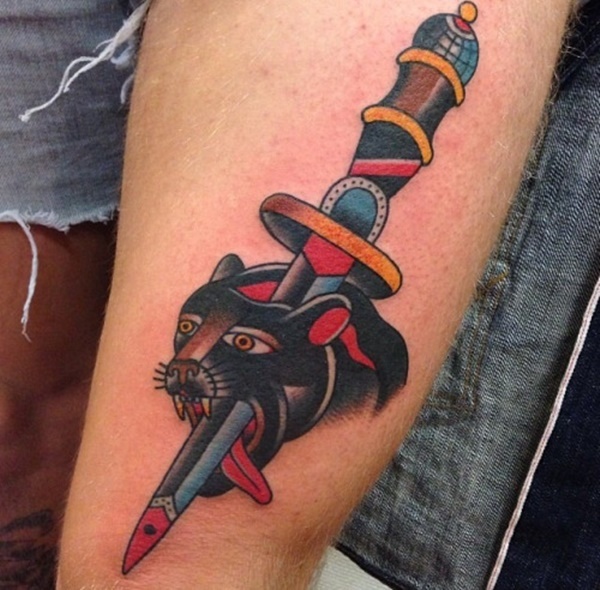 This panther is obviously concerned about the dagger pierced through his skull in this traditional piece. The black panther has an ornate knife shoved through his head and the head of the cat is surrounded by roses. 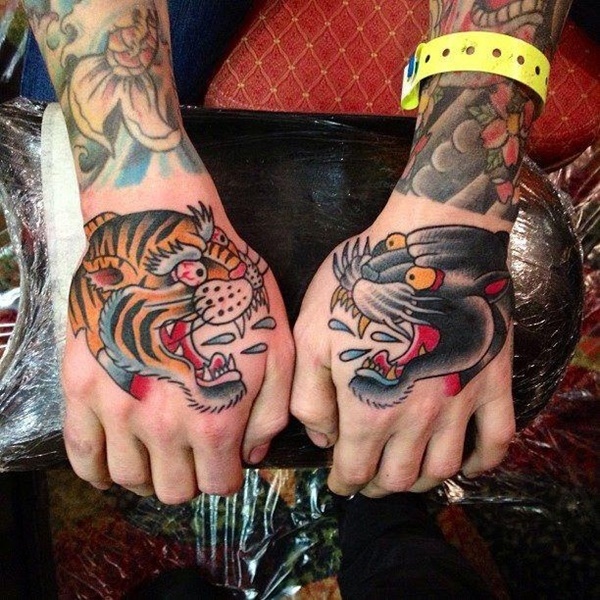 The heads of an incensed tiger and panther are placed in opposition on the wearer’s hands. A simple concept doesn’t equate a lack of details. 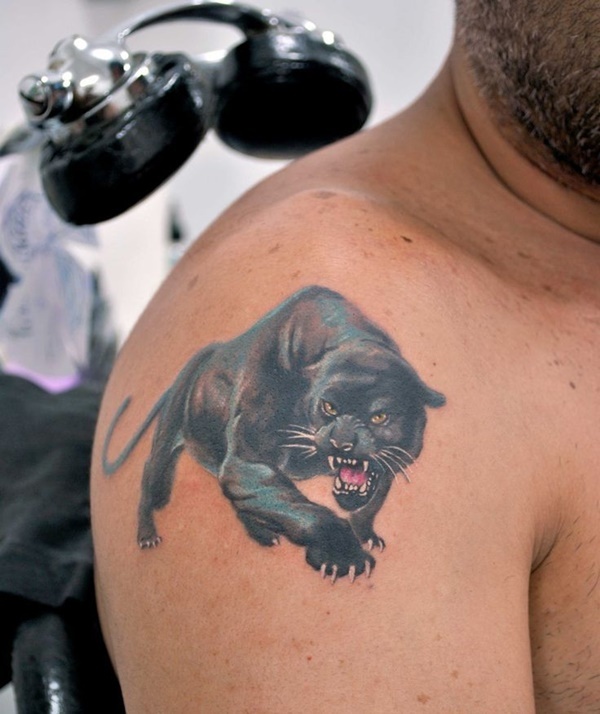 Compared to the panther portraits we’ve seen, this tattoo grossly lacks complexity. 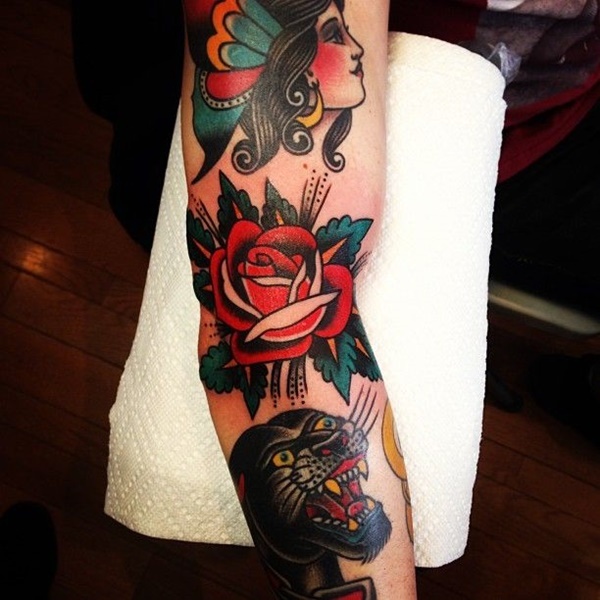 Once again we see a panther and roses motif in a traditional style. I love the details and concept of this piece. 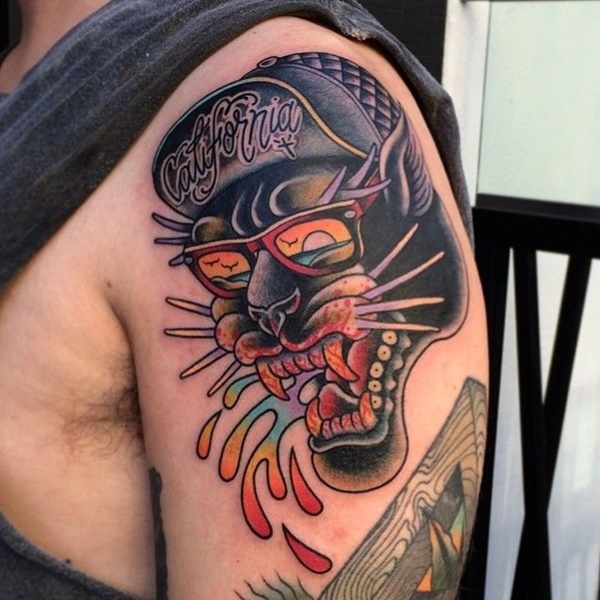 A Californian panther sports a pair of wayfarers and a hat with the brim bent up. The details of this piece show a reflection of a sunset in the sunglasses lenses, blood splattered on the teeth and gums, multicolored saliva, and a wing replaces the panther’s ear. 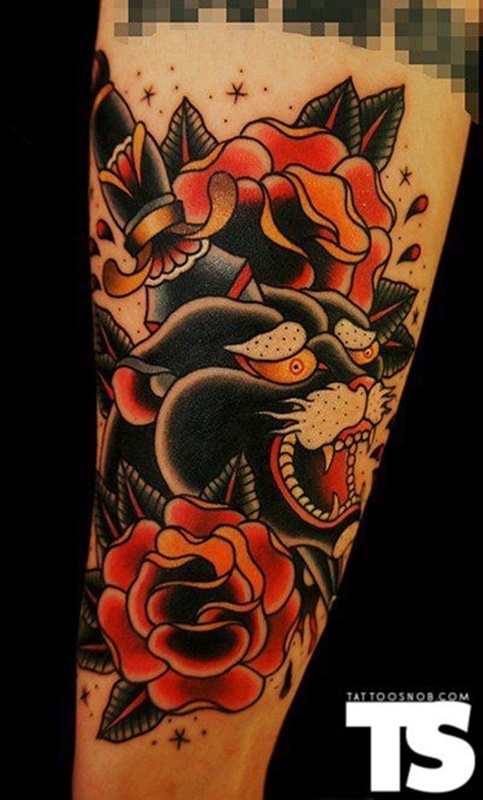 A fragmented panther is intertwined with a rose in this abstract piece inked on the wearer’s forearm. The head of a panther is overlaid a blue rose and spiderweb motif. Spiderwebs were prevalent in prison tattoos and represent the wearer being trapped. 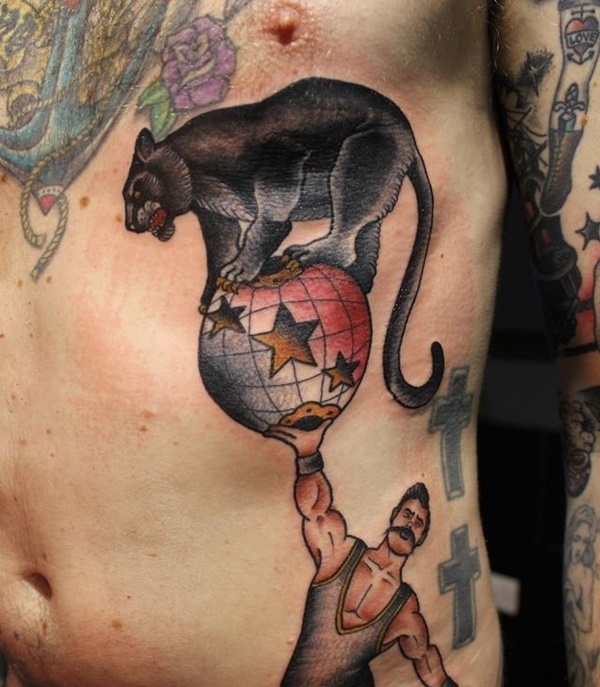 This tattoo deviates from the tattoos we’ve seen by depicting a circus strongman holding a globe aloft, as a panther balances atop the globe. This tattoo is an example of a simple concept with exceptional execution. 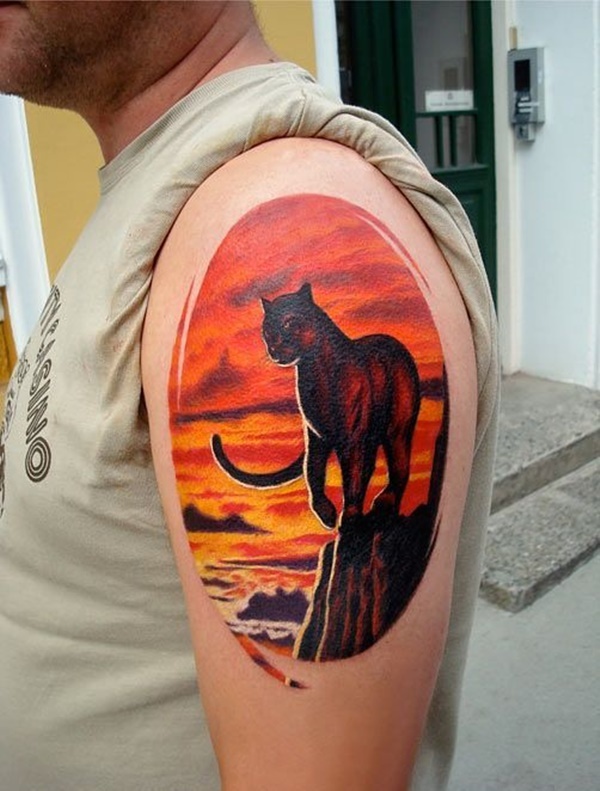 A hyper realistic panther is depicted using superb shading and color distribution on the wearer’s bicep. 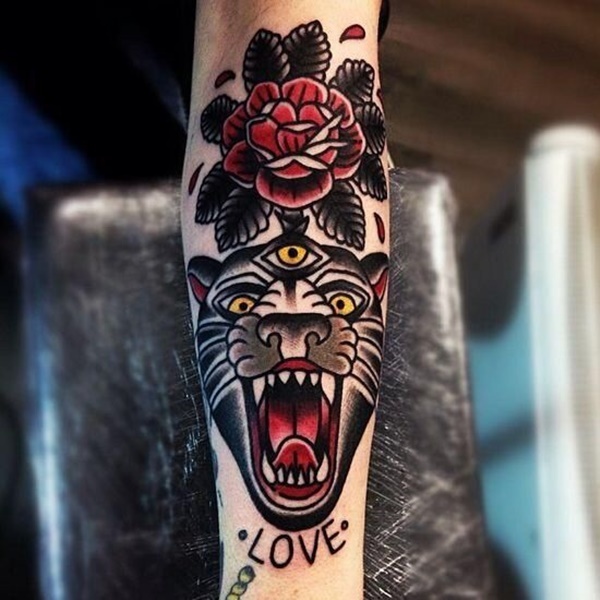 An abstract depiction of a three eyed panther, a rose, and the word “LOVE” is depicted on the wearer’s forearm. The placement is the best part of this tattoo. 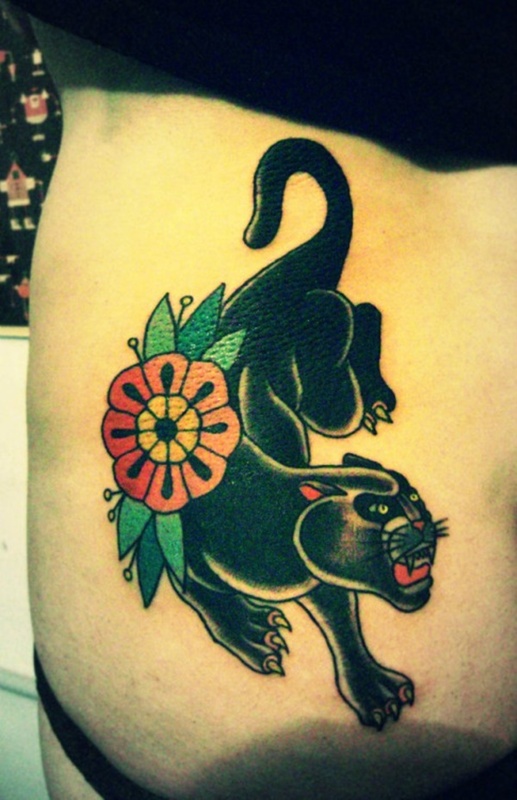 A typical panther portrait is depicted in the middle of the wearer’s stomach, just above the belly button. 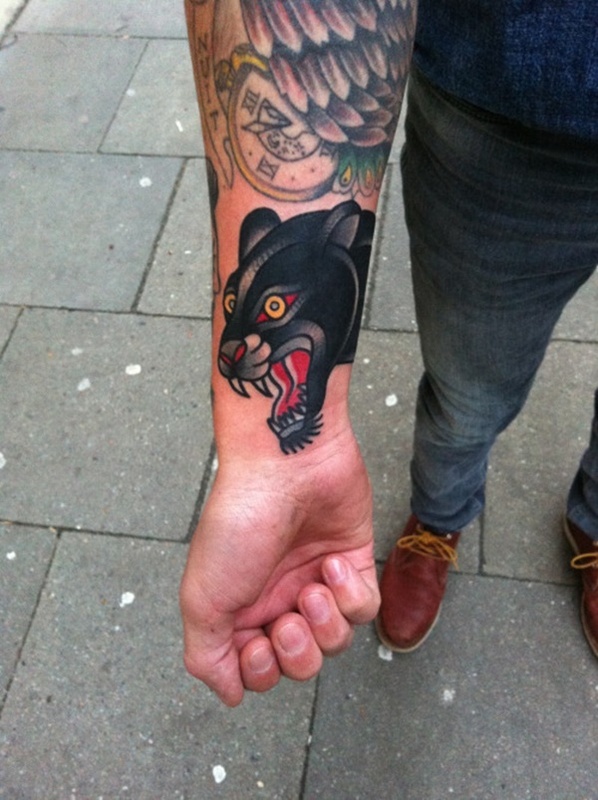 Another traditional portrayal of a panther is shown on the wearer’s hand, however, this piece is an exceptional example of shading. Notice how the panther isn’t a solid black, but is instead shaded around lines that make the big cat look muscular. This abstract piece creates the outline of a stalking panther with a series of black lines and a pair of vibrant, green eyes. 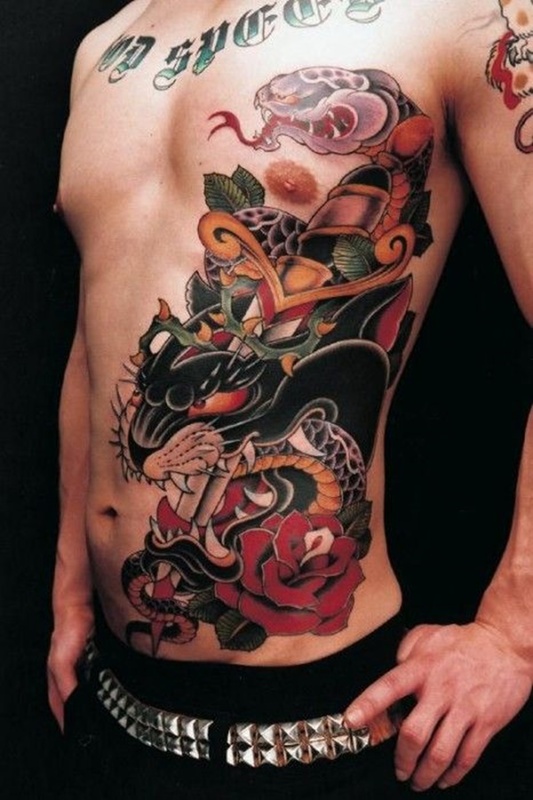 A 3/4 view can create complications for a tattoo artist. 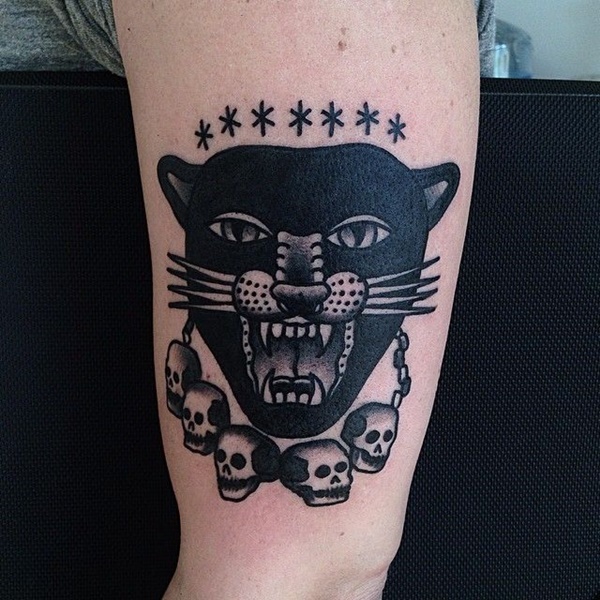 For example, the eyes of this panther are noticeably lopsided and take away from the tattoos aesthetic. 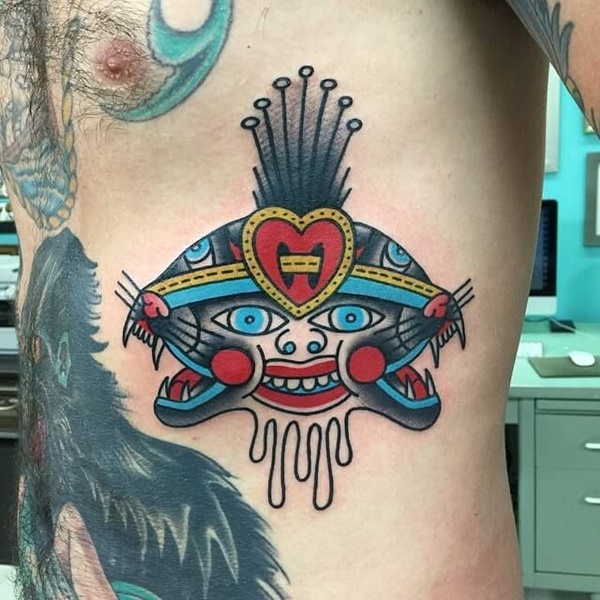 This oddly constructed tattoo portrays a creepy smiling face reminiscent of a cabbage patch kid wearing a headdress composed of panther faces. 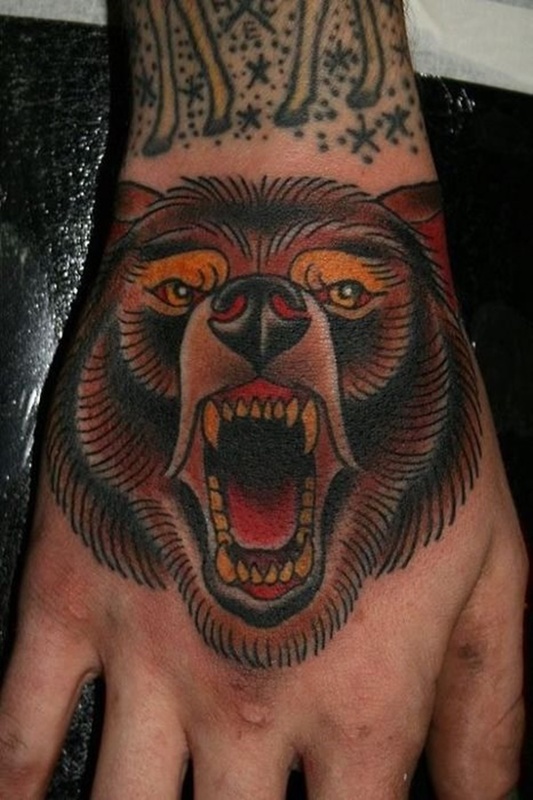 This hand tattoo uses traditional coloring and styling to depict a bear. This superior tattoo is an elaborate design showing a panther’s head pierced with a dagger, coiled by a snake, and surrounded by roses. Effective use of color distribution and shading to create the snake’s scales make this piece pop. 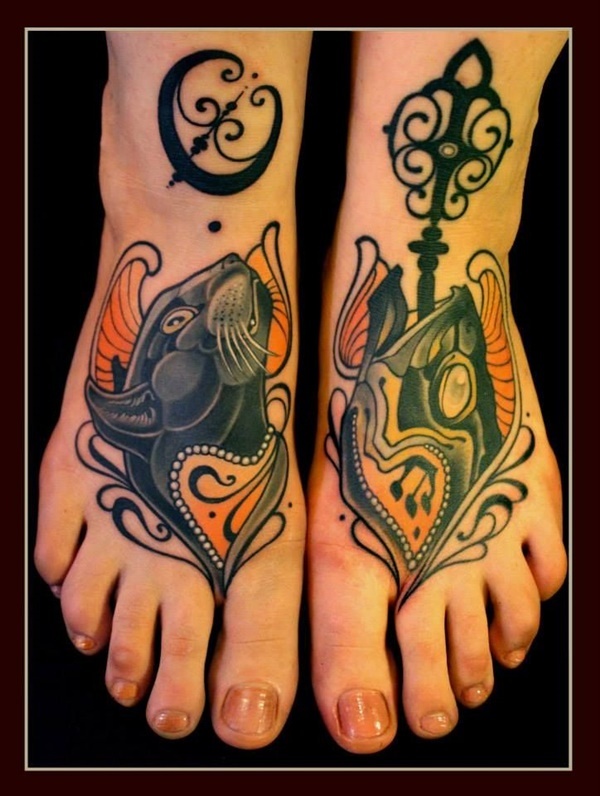 This obscure tattoo shows a house cat and a fish depicted on the wearer’s feet. The animals are surrounded by a striking orange pattern and look upward towards a scroll design and a key. 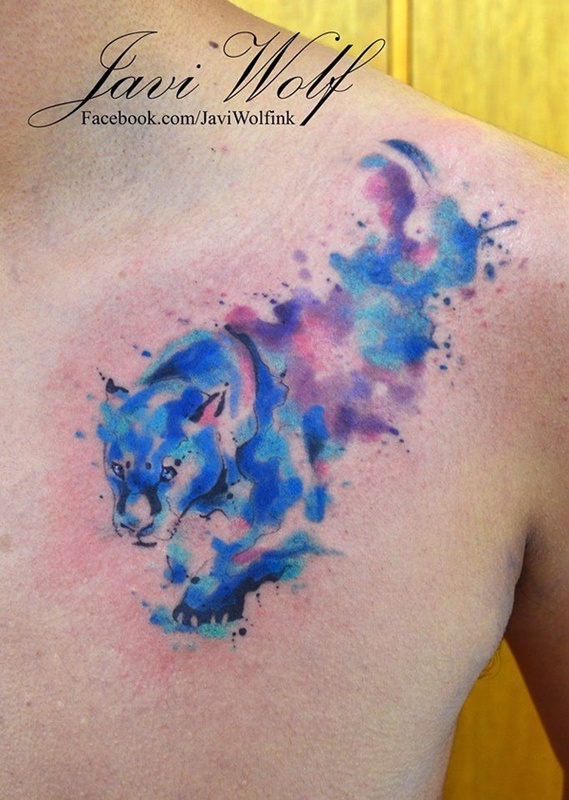 Blue and purple watercolor smears create the body of a stalking panther on this wearer’s chest. 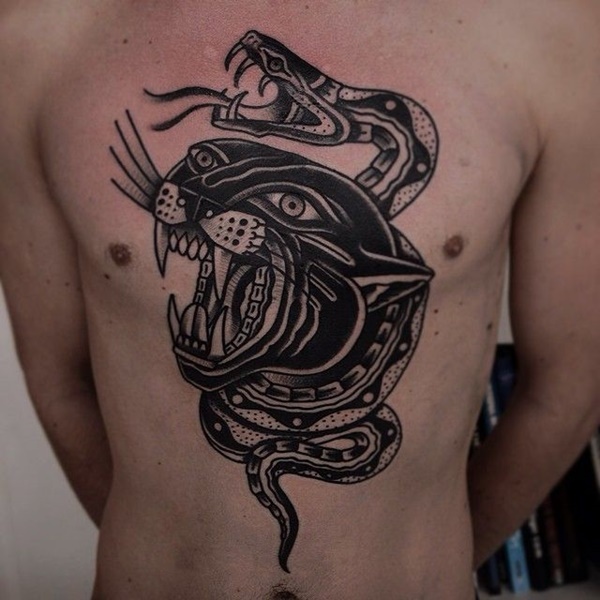 This panther is depicted in a tribal style, using bold black lines to create the image. A picture of the beautiful tattoo we saw earlier from another angle. 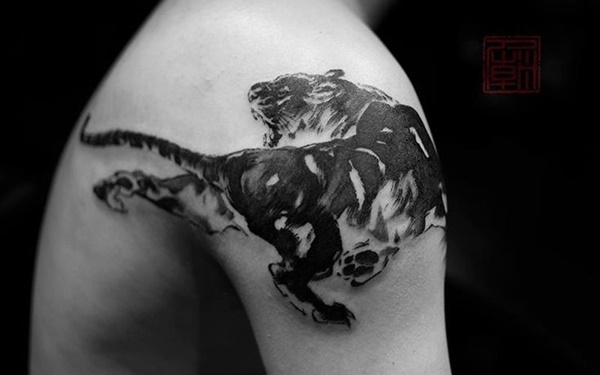 This tiger, depicted on the wearer’s bicep, is created using a black and gray, sketch style. 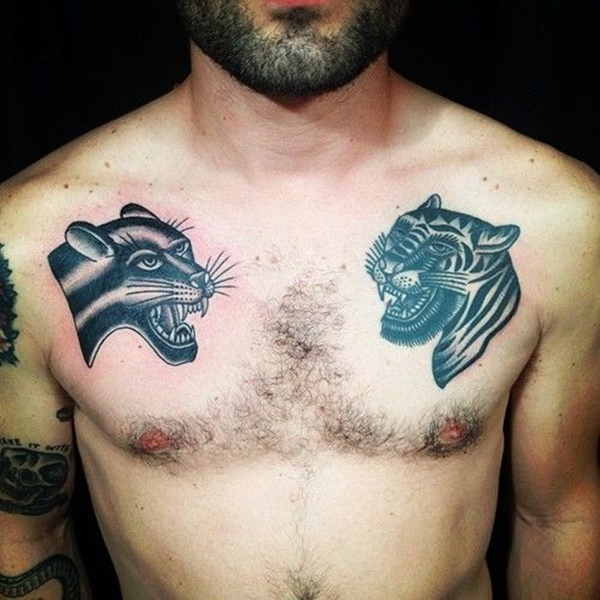 These tattoos, shown on the wearer’s chest, depict a tiger and panther in black and gray ink. While the panther looks somewhat vicious the tiger has an amused look on his face. A black and gray rendition of the popular snake versus panther motif. 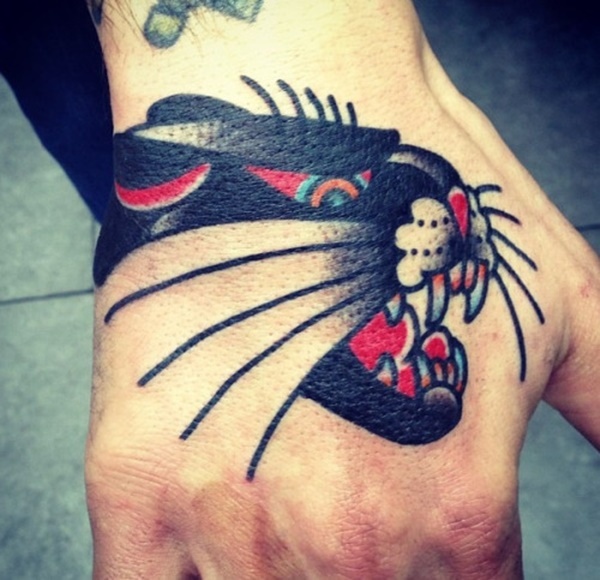 This traditionally styled panther is shown ripping his claws through the wearer’s flesh. 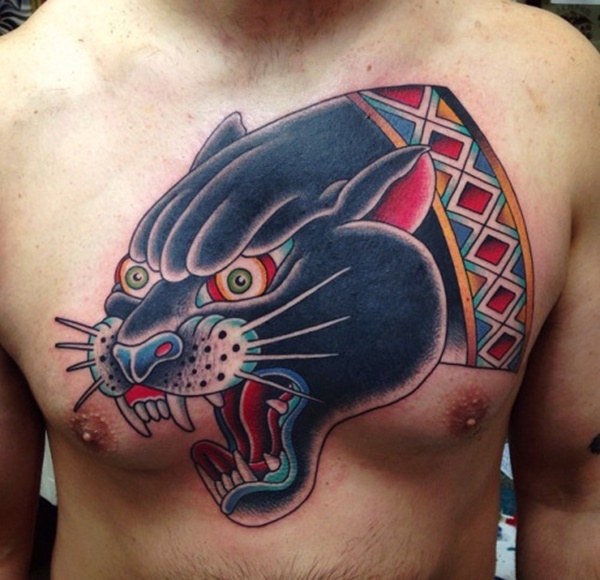 This stylized black panther is depicted knocking a bird from the sky while wearing a medallion with a heart. The piece is surrounded by red roses that add a nice touch of color. A twist on this popular image shows the cat with a turned head and a menacing expression. 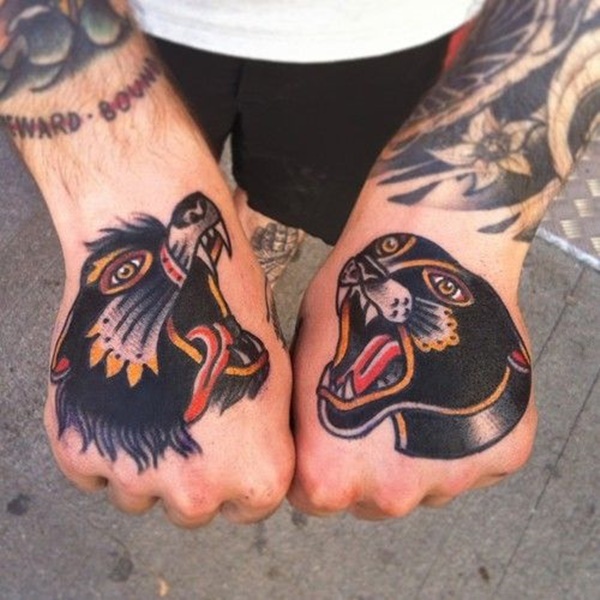 Shown on the wearer’s hands are a dog and panther depicted in a traditional style. 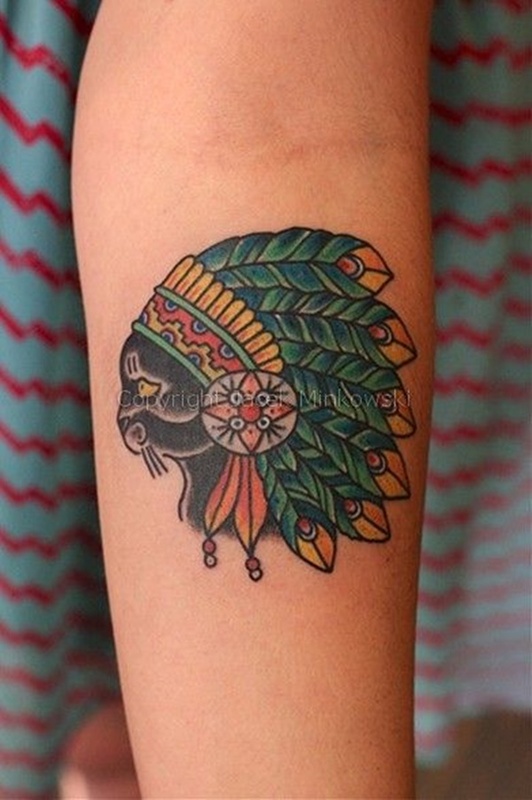 This colorful tattoo portrays a solemn house cat wearing a Native American Headdress. This tattoo shows a lotus flower with a mandala pattern potted in the head of a black panther. 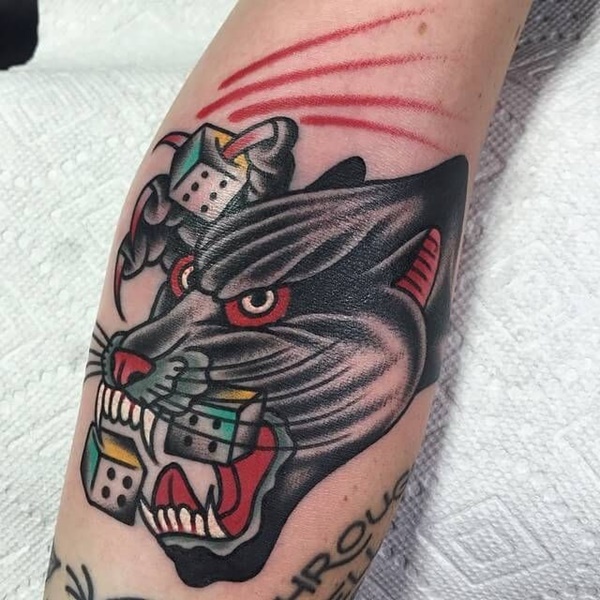 This tattoo shows a black and red panther surrounded by dice. Here is another photo of the tribal styled panther we saw earlier. This tattoo is cluttered and non-cohesive. None of the subject matter correlates except for the fact they are all done in a traditional style. A traditional image done in non-traditional style. 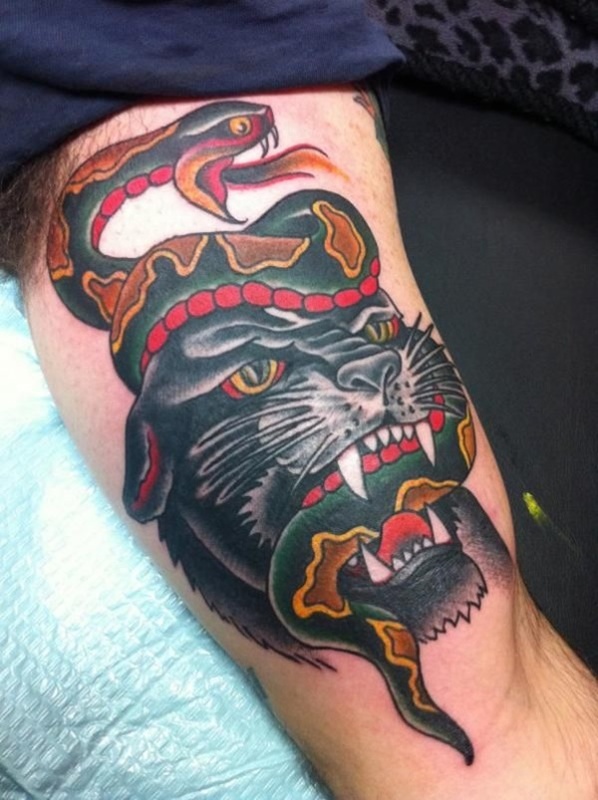 This tattoo shows a panther and snake fighting and colors the piece with vibrant reds and blues. 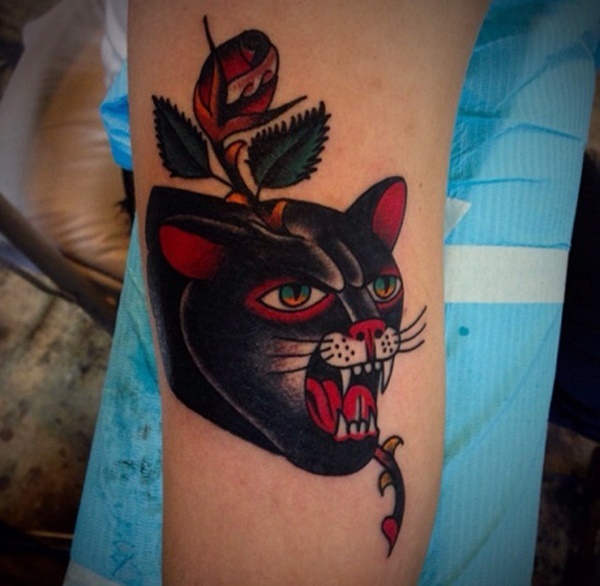 This tattoo shows a panther head replacing a rosebud. 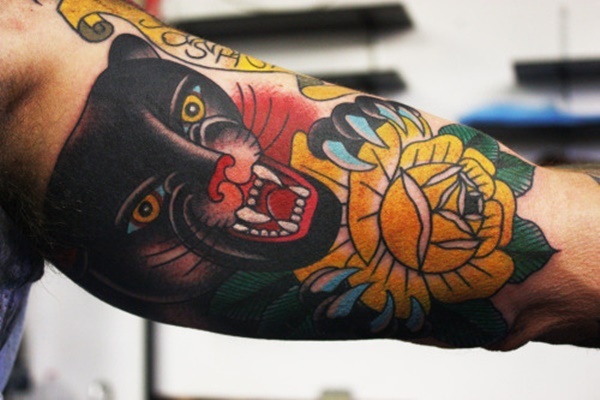 A colorful and creative depiction of a panther is shown on the wearer’s bicep. Exceptional detail is portrayed in the panthers brow line and facial features. 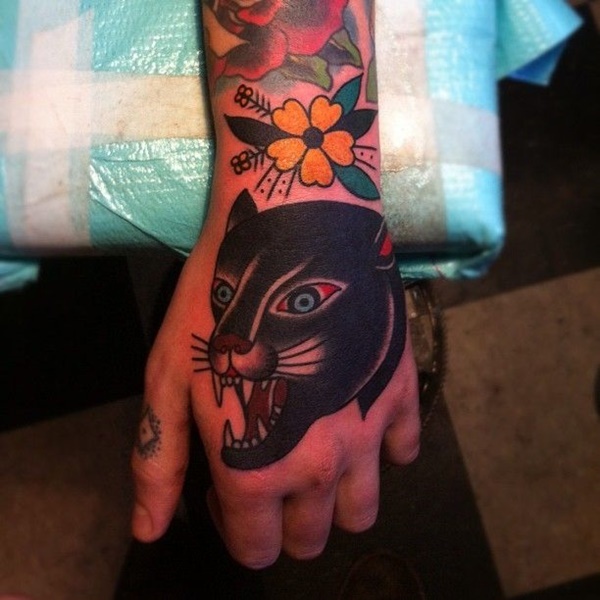 This traditionally styled panther is digging his claws into a bright, yellow rosebud. 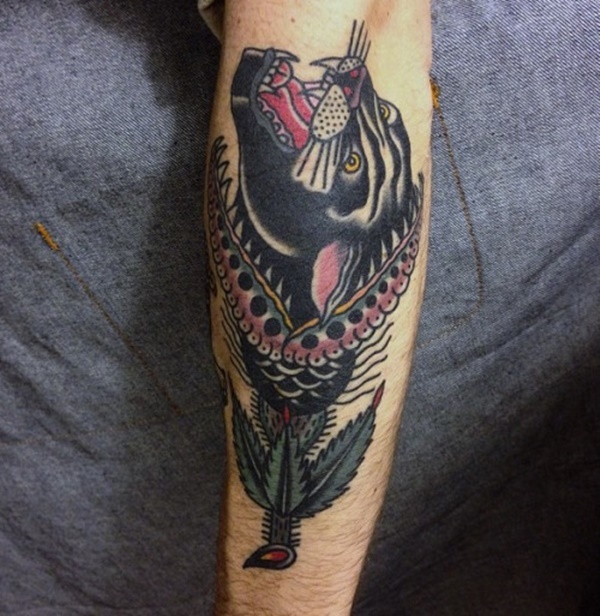 This underfed beast is portrayed in a traditional style on the wearer’s forearm. A mediocre rendering of a panther with three toes is embellished with a red flower. This creative design shows a Venus Flytrap consuming a panther. A black panther is embellished with splashes of red and whiskers so magnificent that nothing can be seen behind them. 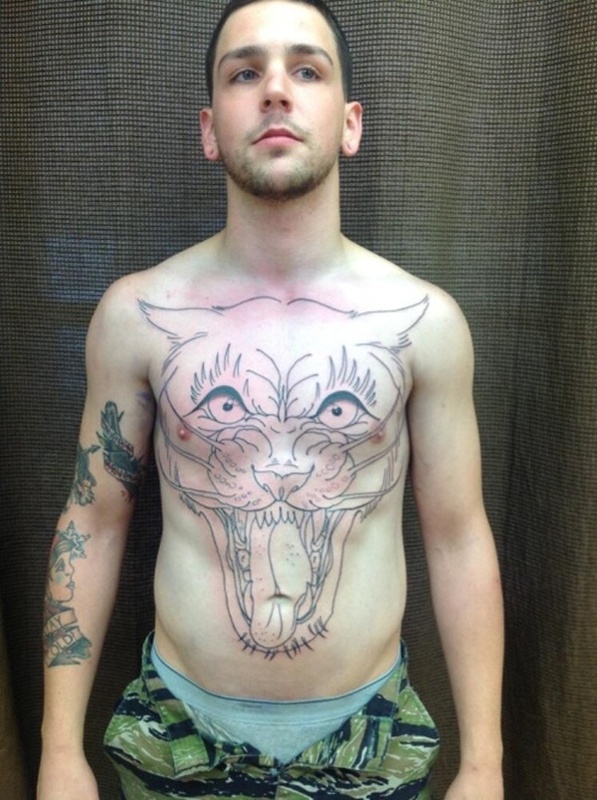 The outline of a massive panther face runs the length of the wearer’s torso in this tattoo. 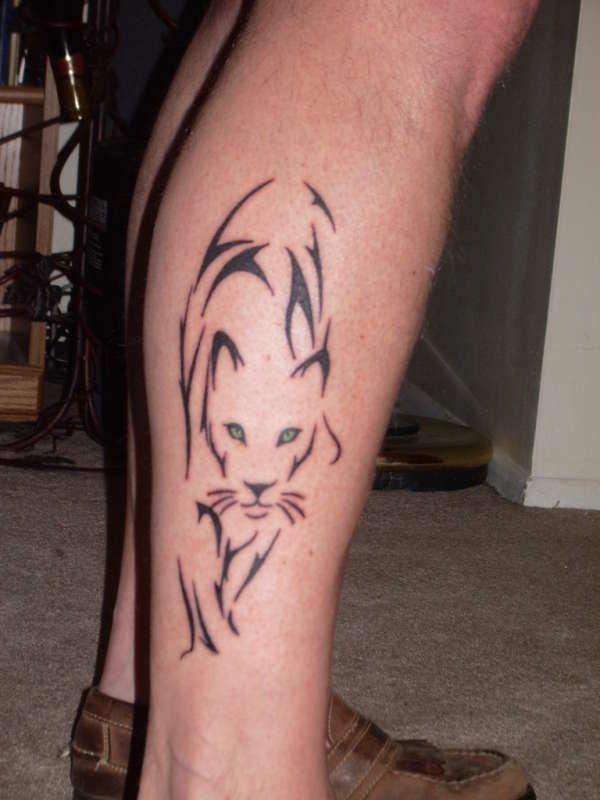 A panther with an awkward look on its face is shown on the wearer’s calf in this tattoo. 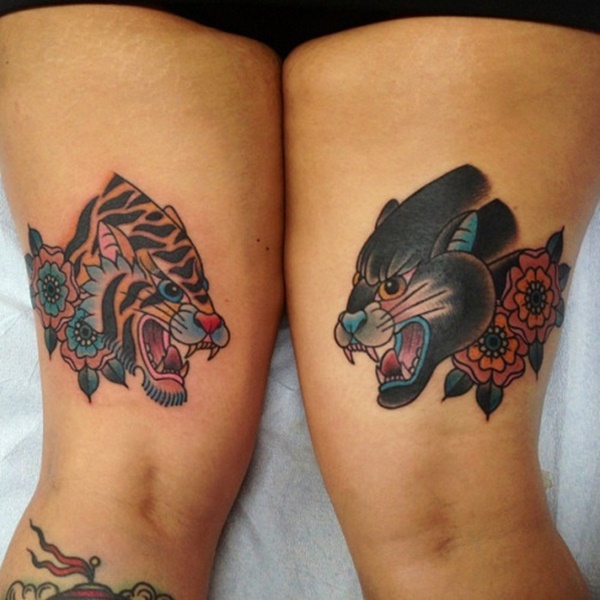 This tattoo depicts a tiger and a panther on the wearer’s thighs. The big cats portrayed in a traditional style and accented with two flowers apiece. 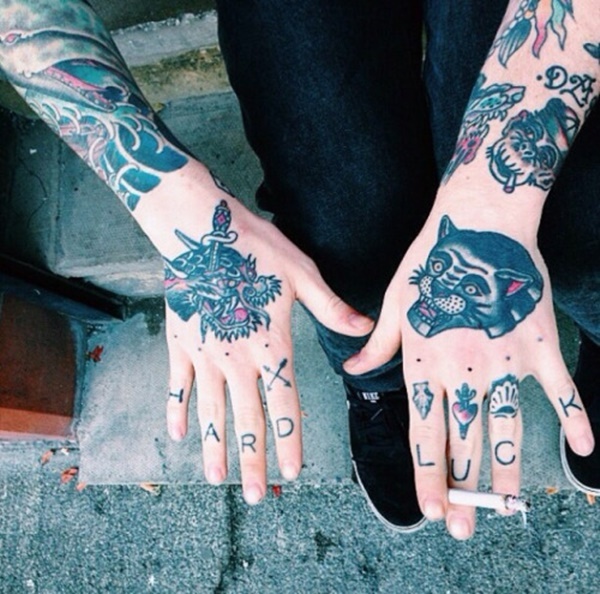 A subtly colored dragon and panther head adorn the wearer’s hands. 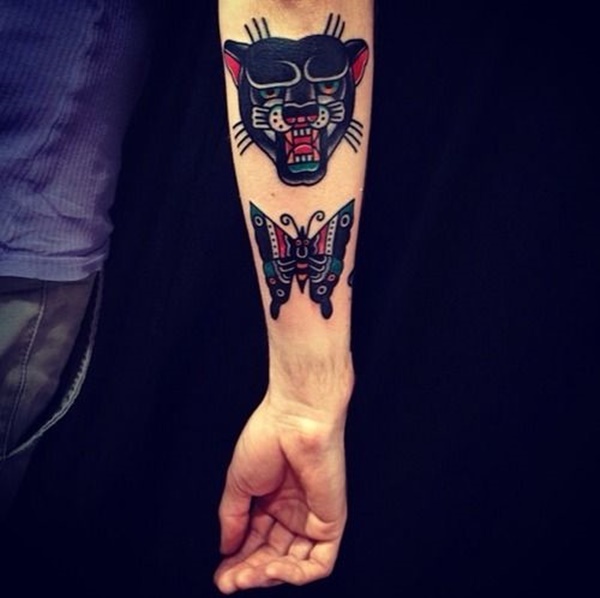 A panther head is accented with bright colors and a tribal patterned collar. 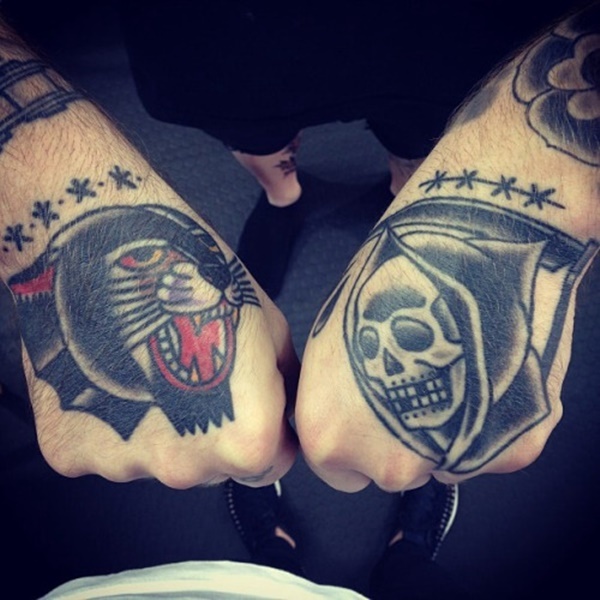 An apathetic panther and grim reaper are portrayed on the wearer’s hands. 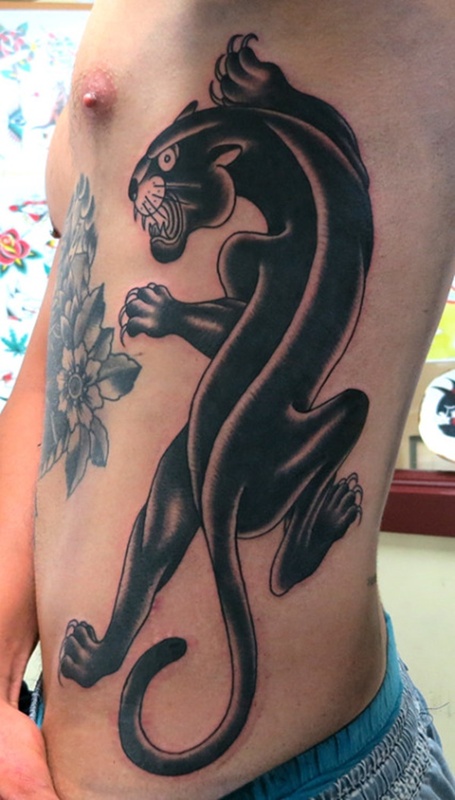 The panther is traditionally colored while the grim reaper is depicted in black and gray. 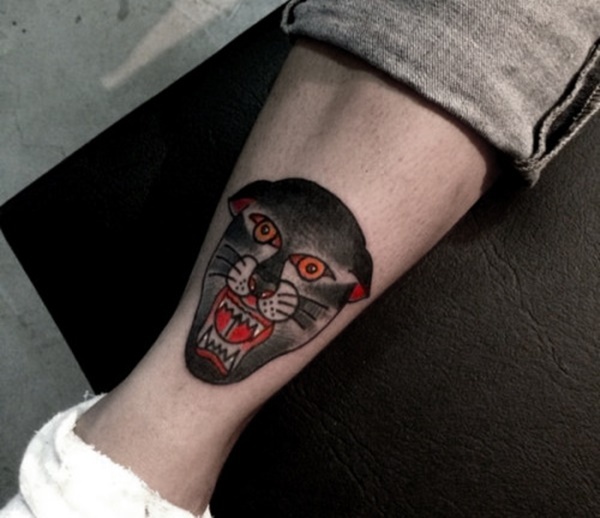 A traditionally styled panther is depicted in black and gray and runs the entire length of the wearer’s torso. I have no idea what this tattoo is supposed to represent. The side profile of a panthers head is shown behind a few fingers with red nail polish. 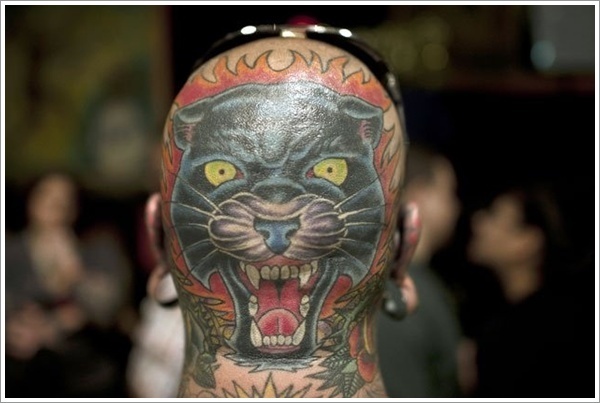 A panthers head is pierced with an elaborate dagger in this traditionally styled tattoo. 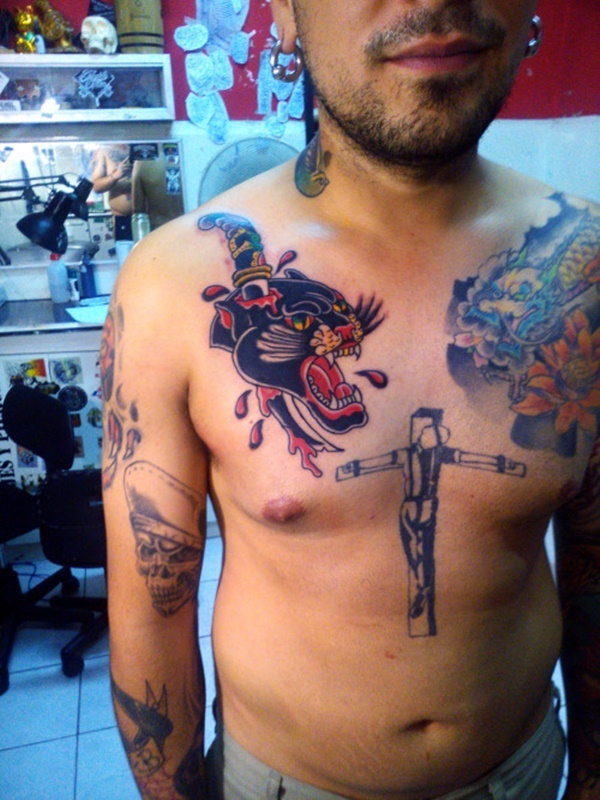 A bold black panther is accented with red details in this tattoo depicted on the wearer’s stomach. 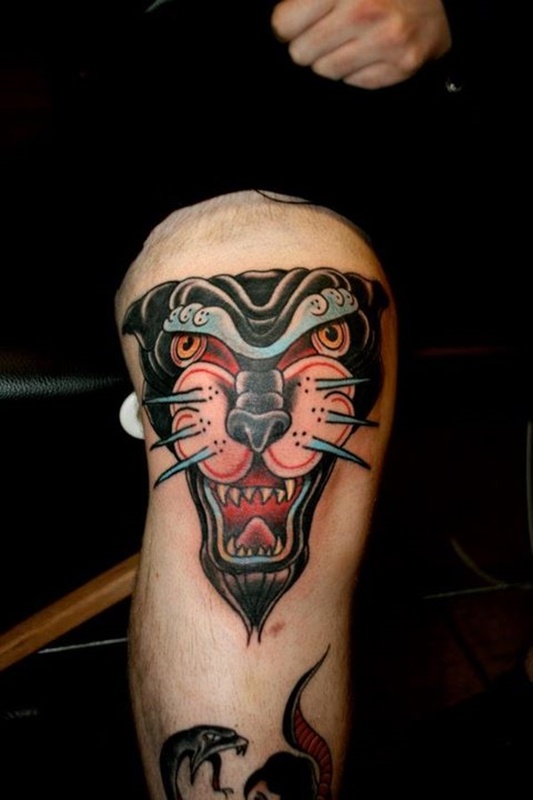 This tattoo is a refreshing deviation from typical panther images. 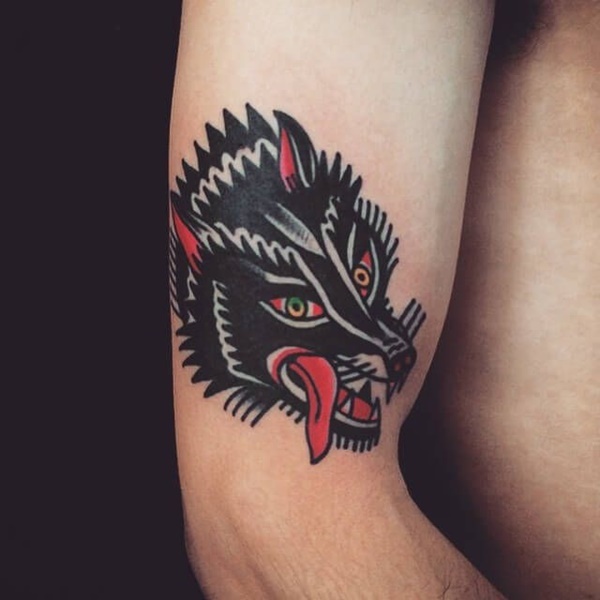 Instead depicting a bright blue tattoo with a spiked collar and over sized fangs. 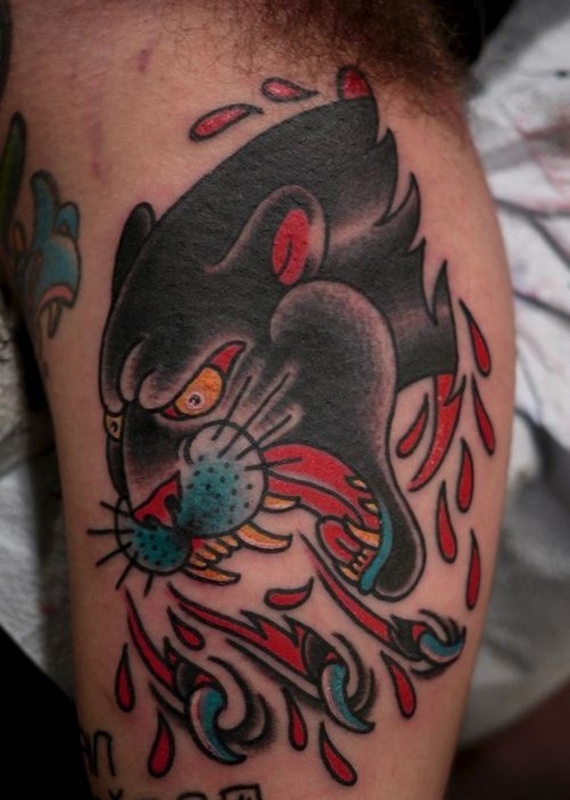 A subtly colored panthers head is portrayed on the wearer’s forearm. 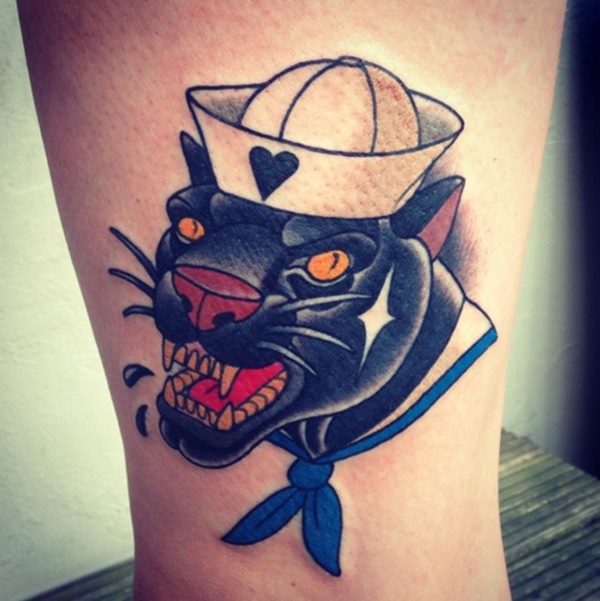 This piece is an ode to the history of panther tattoos, showing a traditionally colored panther wearing a Navy uniform. 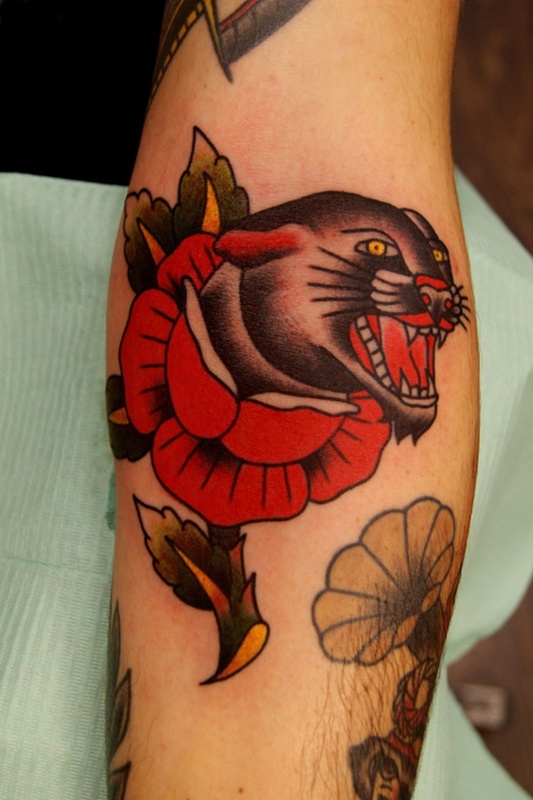 The stem of a rose pierces through a panthers head in this traditional tattoo. 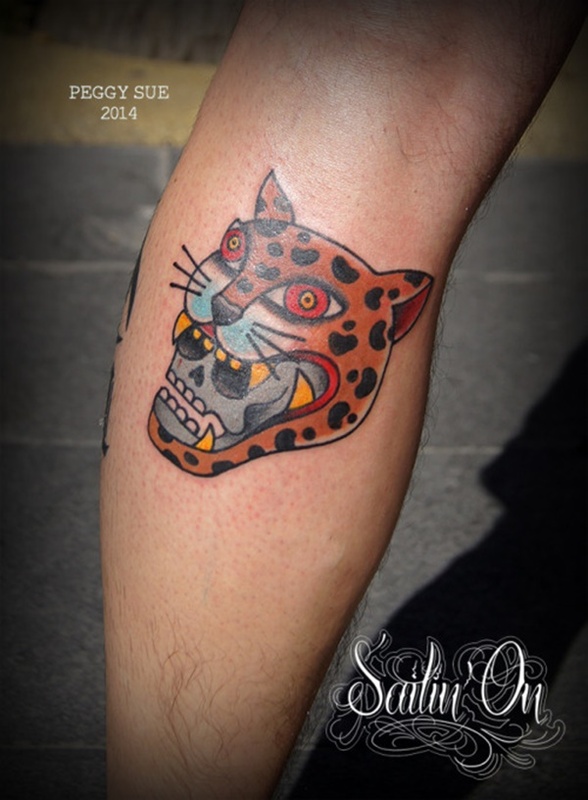 This odd tattoo shows a skull wearing a leopard headdress. 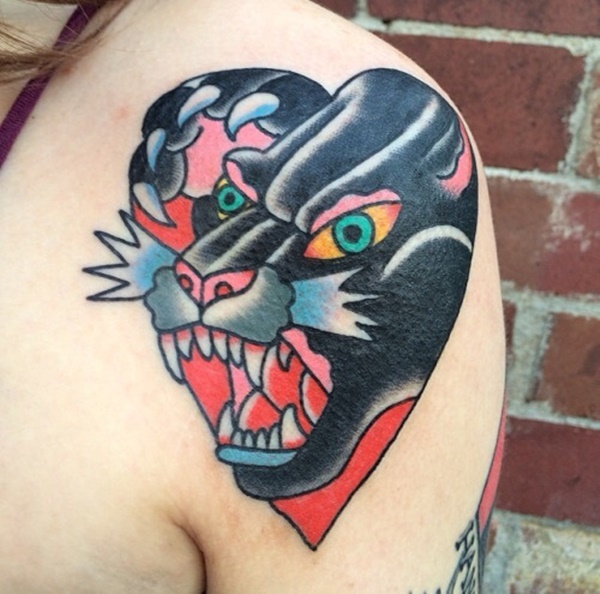 A vignette of a panther is pictured inside of a heart shape in this colorful tattoo. 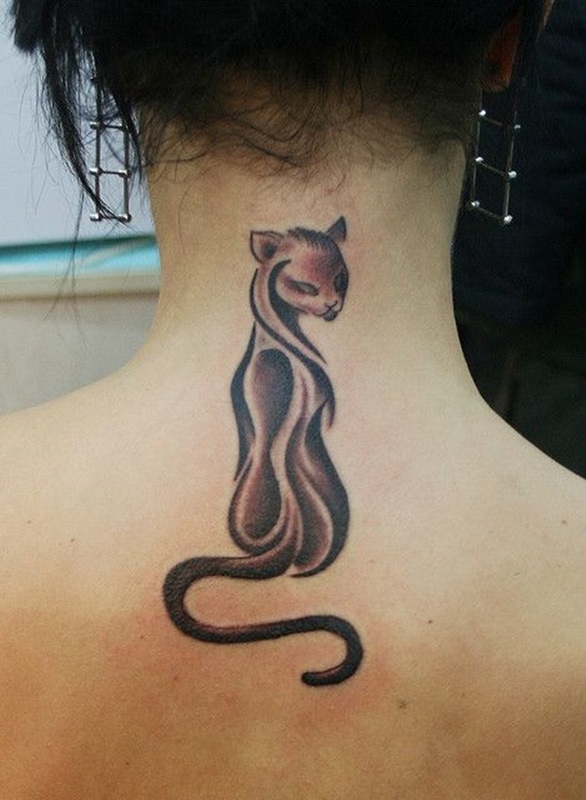 A striped jungle cat is pictured across the width of the wearer’s back in this black and gray tattoo. 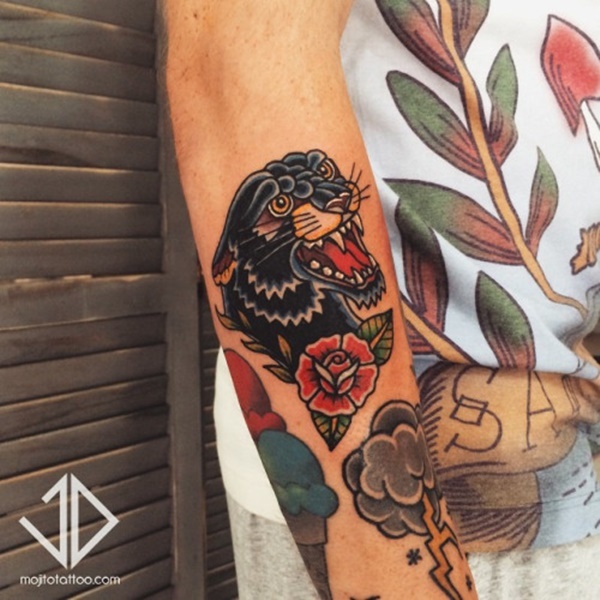 Black and gray portraits of a lion and a panther adorn the wearer’s forearms in this piece. 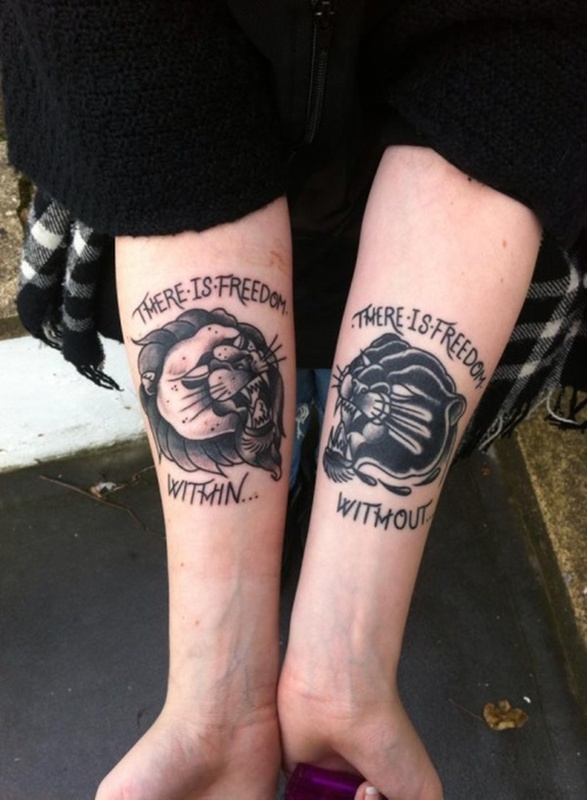 The quote, “Their is freedom within…” surrounds the lion, while the quote “There is freedom without…” surrounds the panther. 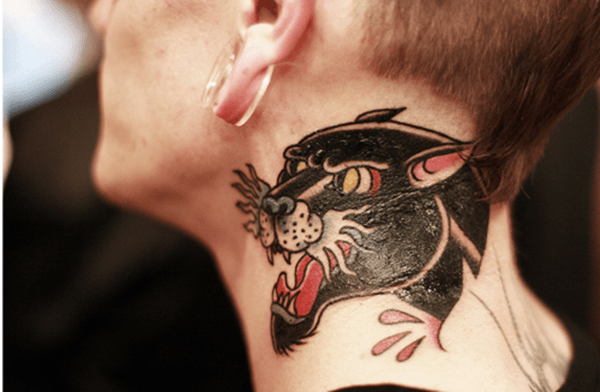 This tattoo portrays a black and gray panther clawing through the wearer’s neck. 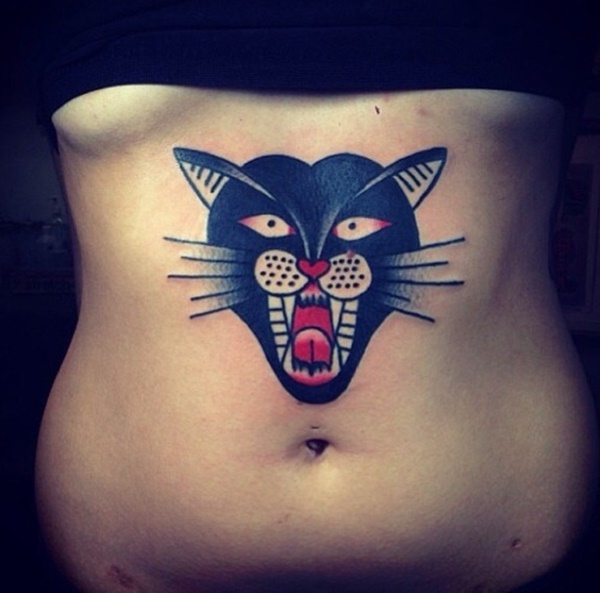 A black panther head is livened up with a mandala pattern in this stomach tattoo. 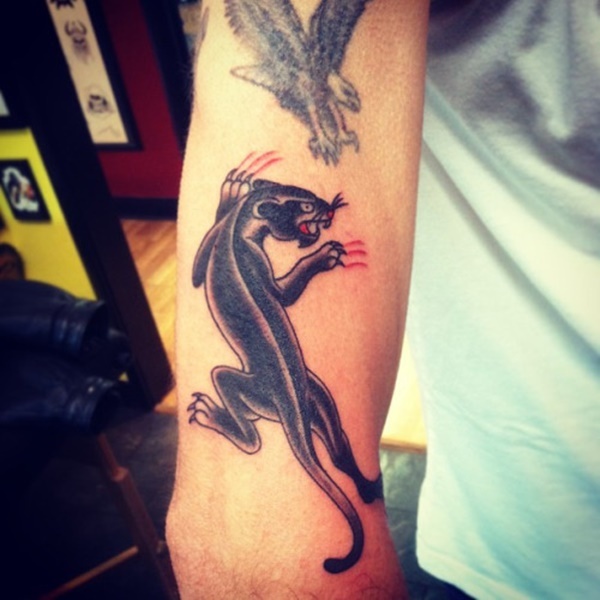 A traditionally styled and colored panther is portrayed on the wearer’s wrist in this tattoo. 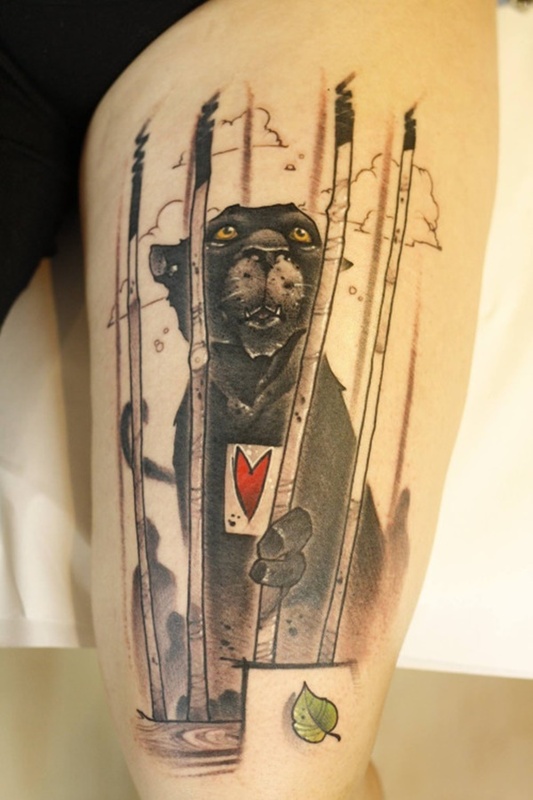 This tattoo shows a pitiable panther trapped in a cage at the zoo. The shadows of onlookers are visible around the cat and the heart of the animal is worn on its chest. 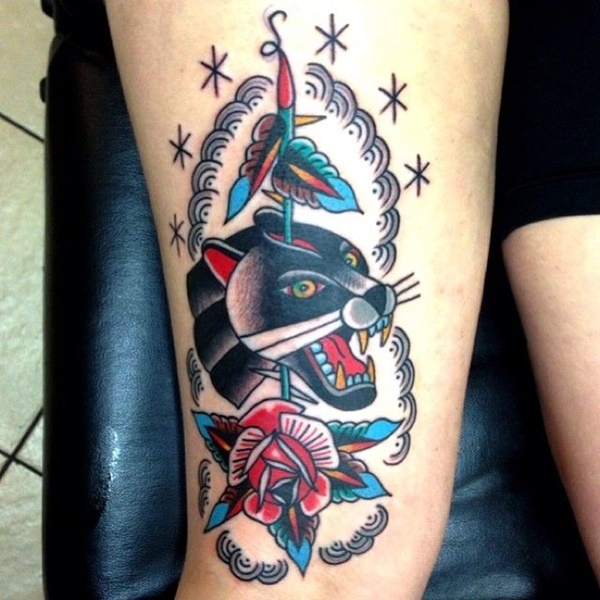 Another traditional tattoo depicting a panther’s head being pierced with a dagger. This piece has added some detail by making the blade exceptionally bloody. 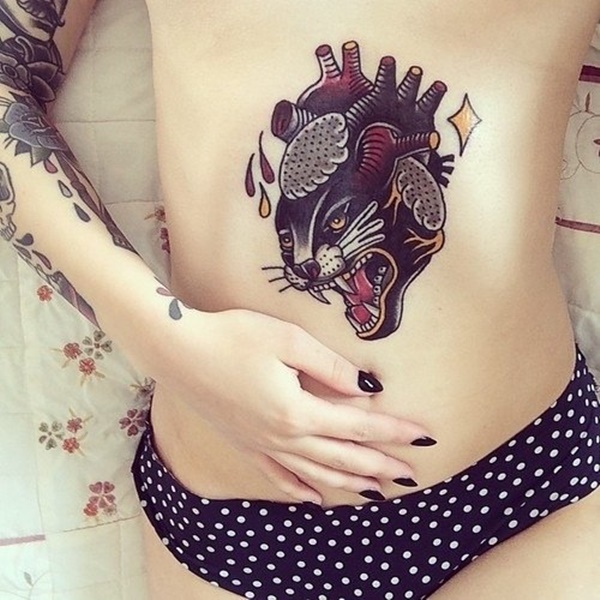 This horrific concept combines a realistic heart with the head of a panther. While I’m not crazy about the concept the work is very sharp and well done. 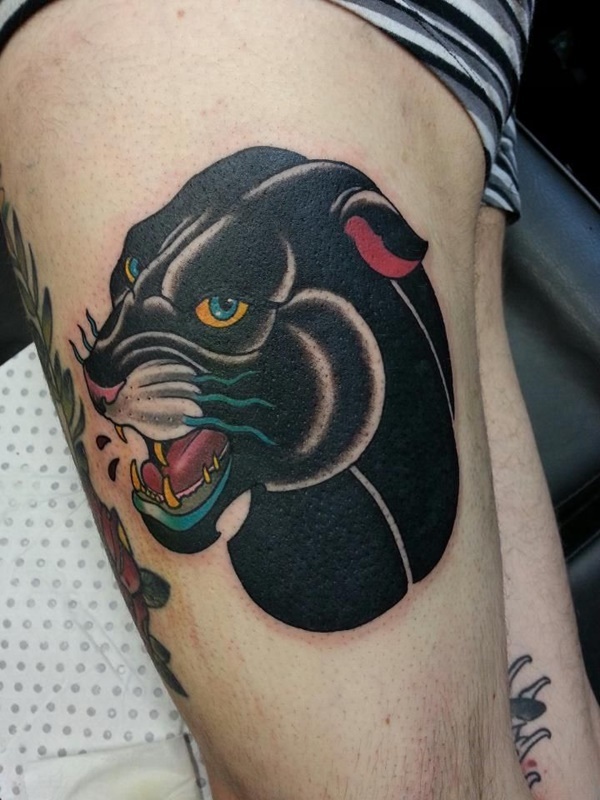 This beautiful piece depicts a hyper realistic panther face. The exceptional use of shading creates an undeniable life in this tattoo. 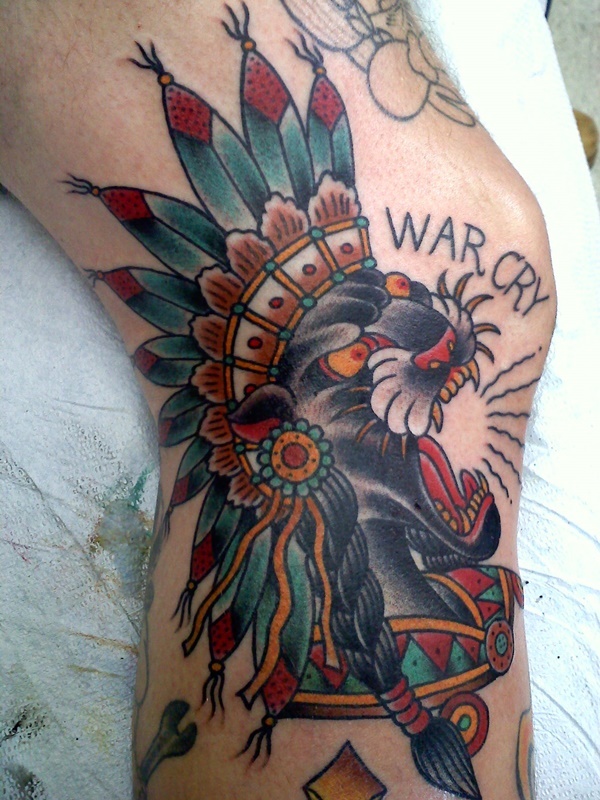 The wearer’s right thigh shows a colorful panther face accented with blood drops. 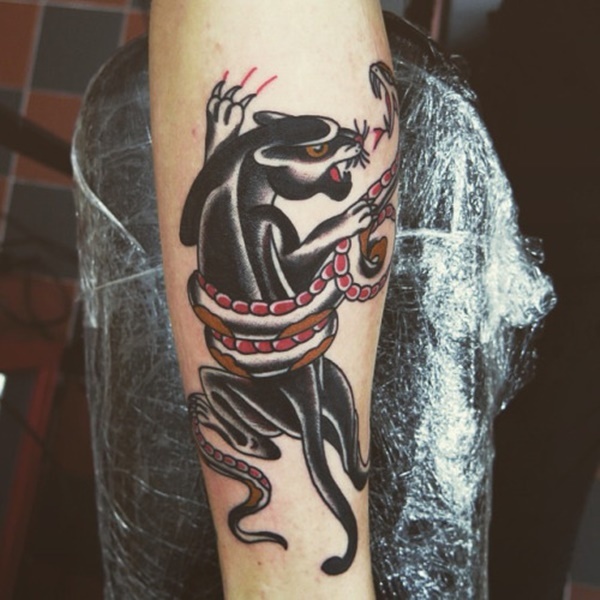 A beautiful example of a panther coiled by a snake is shown in this traditional tattoo. 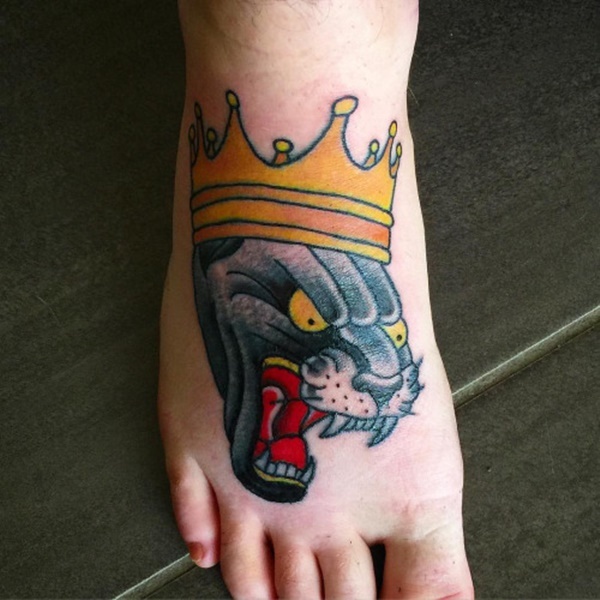 A ferocious panther wearing a crown is rendered on the wearer’s foot in this tattoo. When focusing on an animals face, details are crucial. For example, this panther’s eyebrows are shaped in a way that makes the animal appear concerned, or worried.